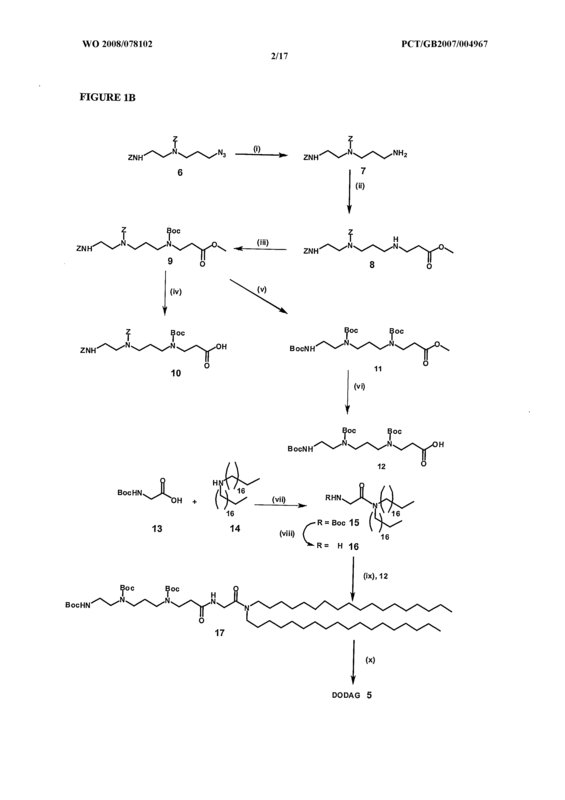 The present invention provides a lipid of the formula (I) R<SUB>3</SUB>R<SUB>4</SUB>N-[Y]<SUB>q</SUB>-(C<SUB>p</SUB>H<SUB>2p</SUB>)-X-Linker-NR<SUB>1</SUB>R<SUB>2</SUB> (I) wherein R<SUB>3</SUB> and R<SUB>4</SUB> are independently selected from H and hydrocarbyl groups; q is an integer selected from 1 to 10; Y represents a group (C<SUB>n</SUB>H<SUB>2n</SUB>)NR<SUB>5</SUB>, wherein (i) when q is 1, n is 2, or (ii) when q is greater than 1, each Y may be the same or different and each n is an integer independently selected from 1 to 10, with the proviso that for at least one unit Y, n is 2, and (iii) each R<SUB>5</SUB> is independently selected from H and hydrocarbyl groups; p is an integer selected from 1 to 10; X is an optional group selected from -NR<SUB>7</SUB>-, -C(=O)-N R<SUB>8</SUB>-, -NR<SUB>9</SUB>-C(=O)-, -C(=O)-, -O-, and -NR<SUB>10</SUB>-C(=0)0-, wherein each R<SUB>7</SUB>, R<SUB>8</SUB>, R<SUB>9</SUB> and R<SUB>10</SUB> is independently selected from H and hydrocarbyl groups, Linker is an optional group selected from amino acid residues, peptide residues and groups of the formula -(OCH<SUB>2</SUB>CH<SUB>2</SUB>)<SUB>1-10</SUB>, -NR<SUB>6</SUB>-(CvH<SUB>2v</SUB>)-C(=O)-, wherein R<SUB>6</SUB> is H or a hydrocarbyl group and v is an integer selected from 1 to 11, and -C(=0)-(CH<SUB>2</SUB>)<SUB>0-10</SUB>-CH<SUB>2</SUB>-C(=0)-; R<SUB>1</SUB> is selected from acyclic groups having from 4 to 30 carbon atoms; and R<SUB>2 </SUB>is selected from H and acyclic groups having from 4 to 30 carbon atoms. 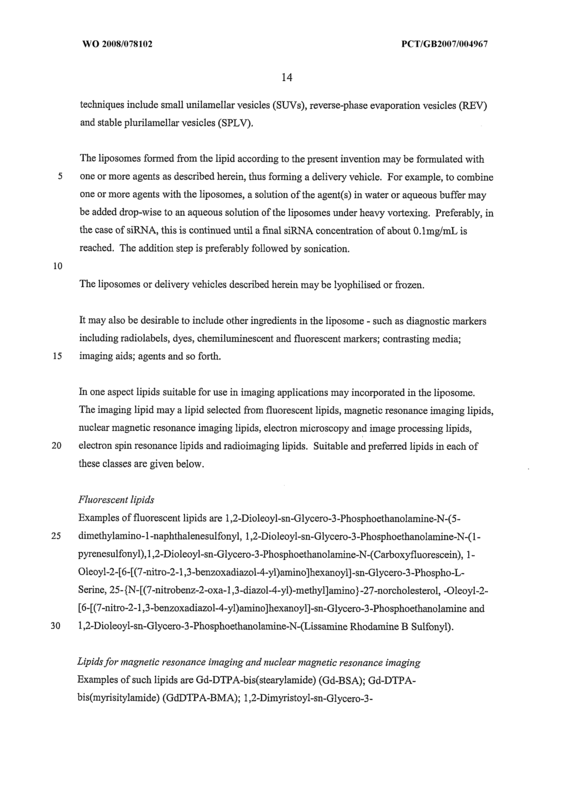 Said lipids can be used in a delivery vehicle (e.g. 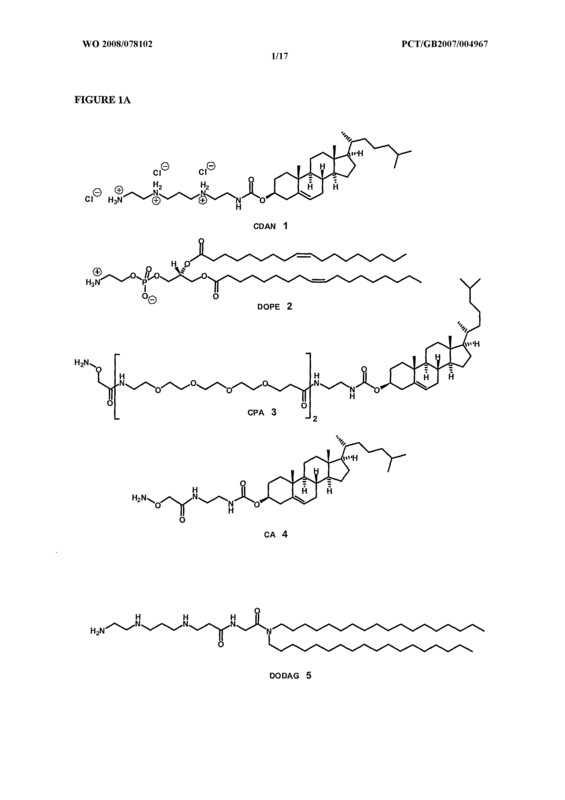 micelle or liposome) for the delivery of one or more (therapeutic or diagnostic) agents. 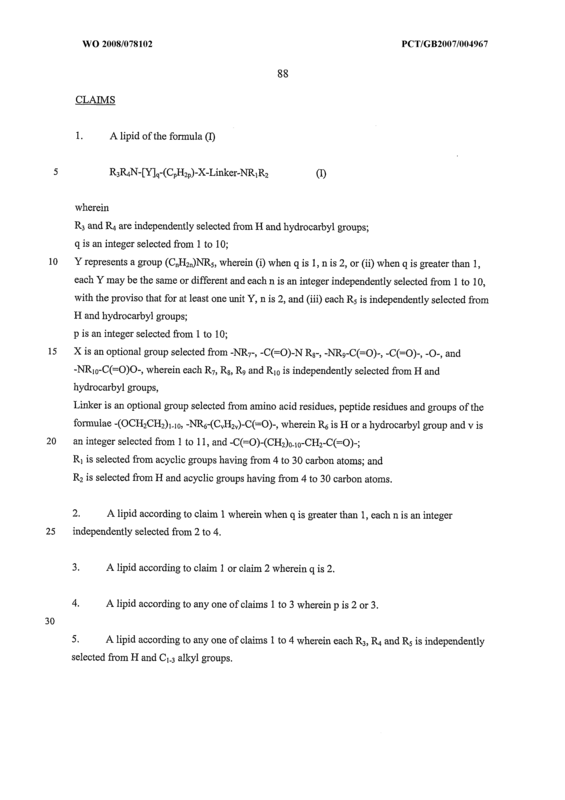 R2 is selected from H and acyclic groups having from 4 to 30 carbon atoms. 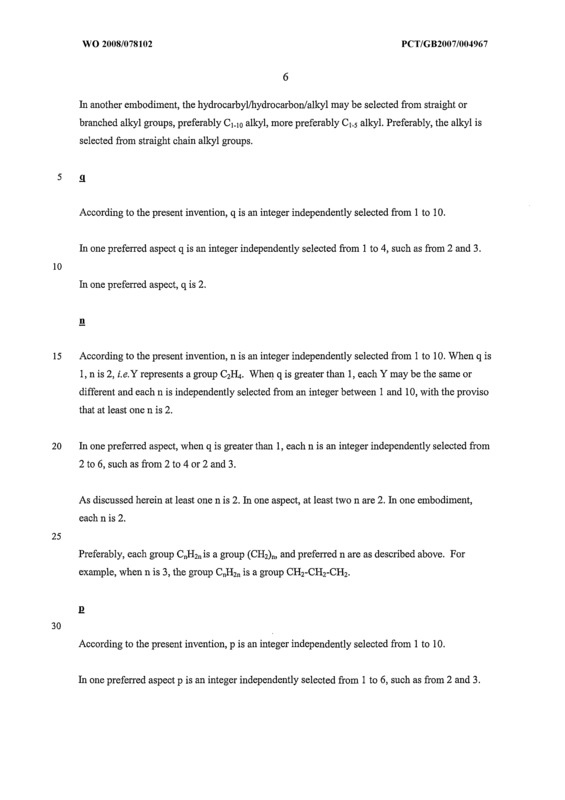 A lipid according to claim 1 wherein when q is greater than 1 , each n is an integer independently selected from 2 to 4. 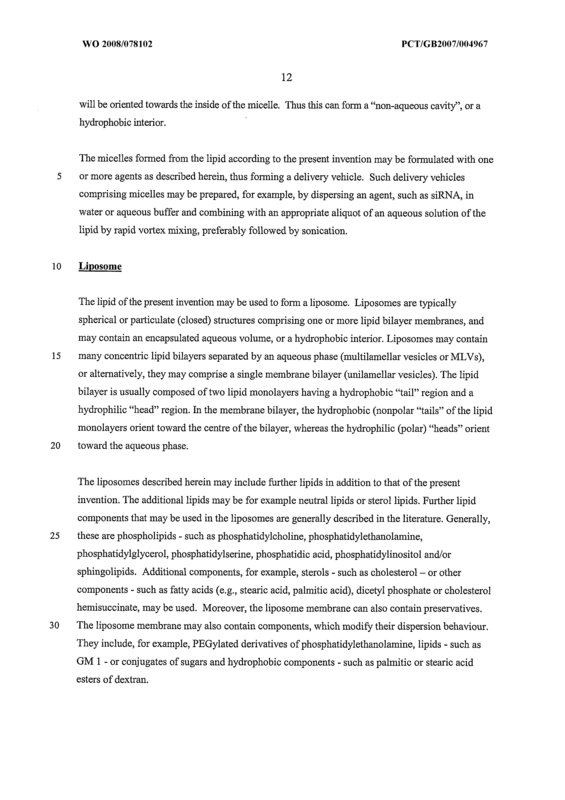 A lipid according to claim 1 or claim 2 wherein q is 2. 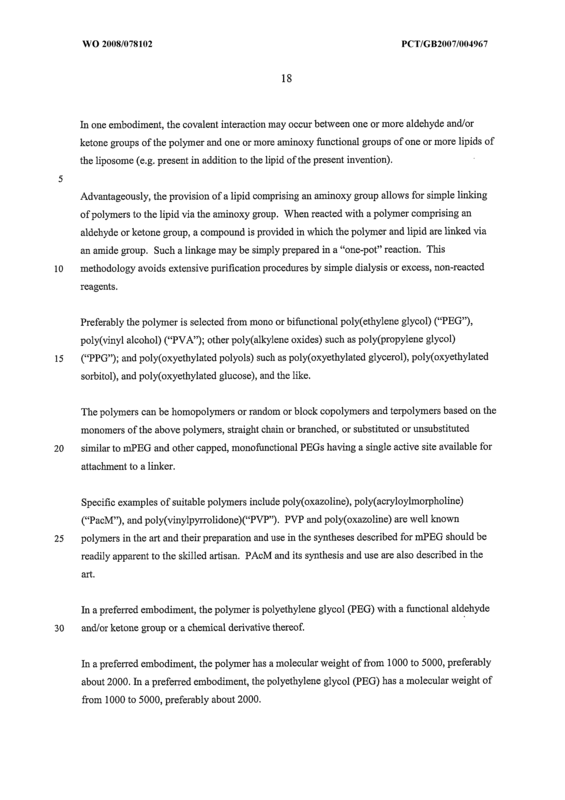 A lipid according to any one of claims 1 to 3 wherein p is 2 or 3. 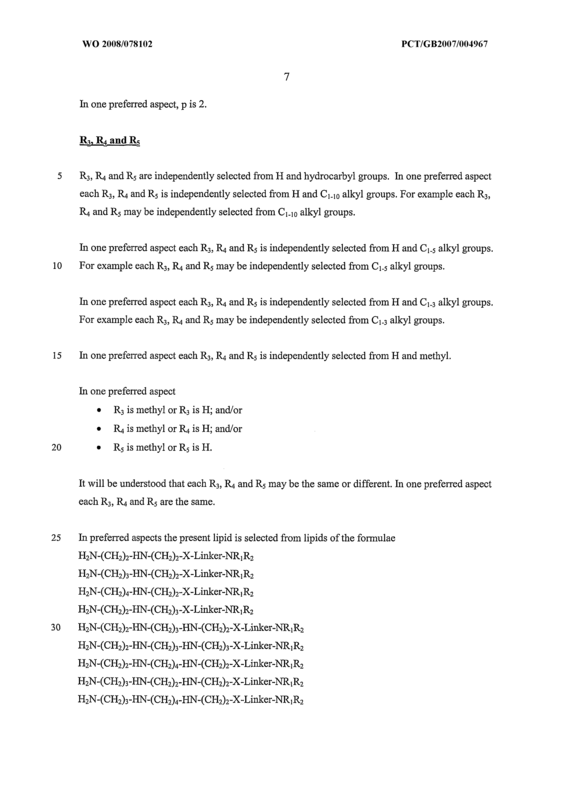 A lipid according to any one of claims 1 to 4 wherein each R3, R4 and R5 is independently selected from H and Ci-3 alkyl groups. 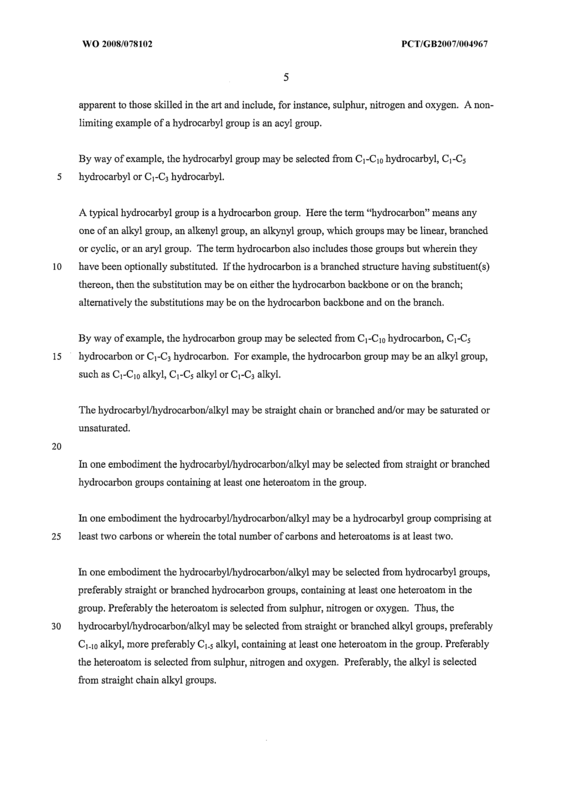 A lipid according to any one of claims 1 to 5 wherein each R3, R4 and R5 is independently selected from H and methyl. 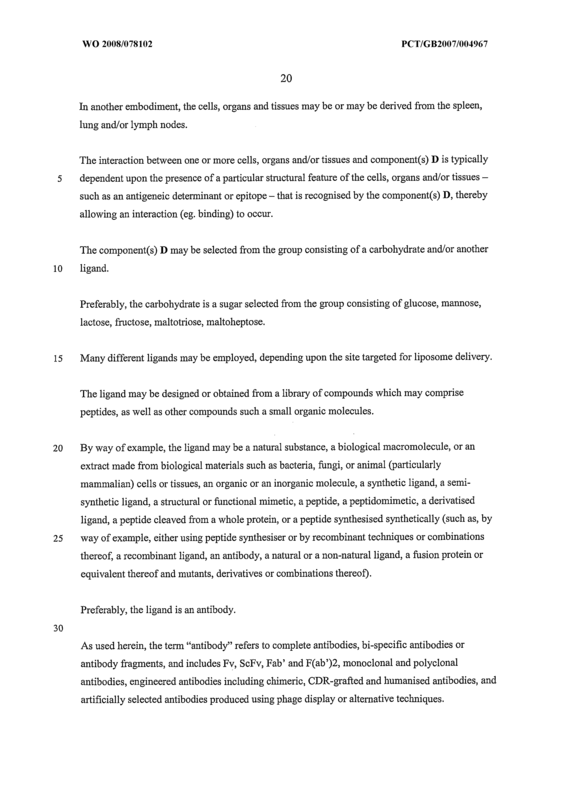 A lipid according to any one of claims 1 to 6 wherein each R3, R4 and R5 are the same. 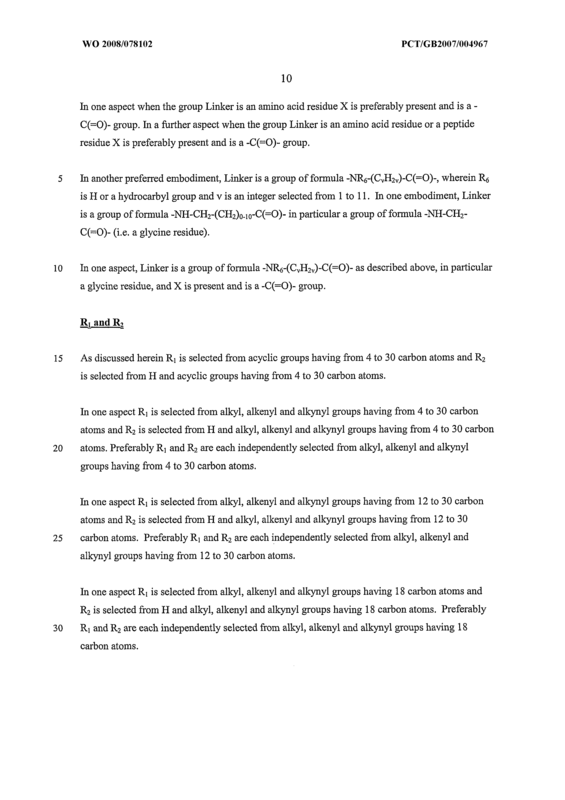 A lipid according to any one of the preceding claims wherein R1 and R2 are each independently selected from alkyl, alkenyl and alkynyl groups having from 4 to 30 carbon atoms. 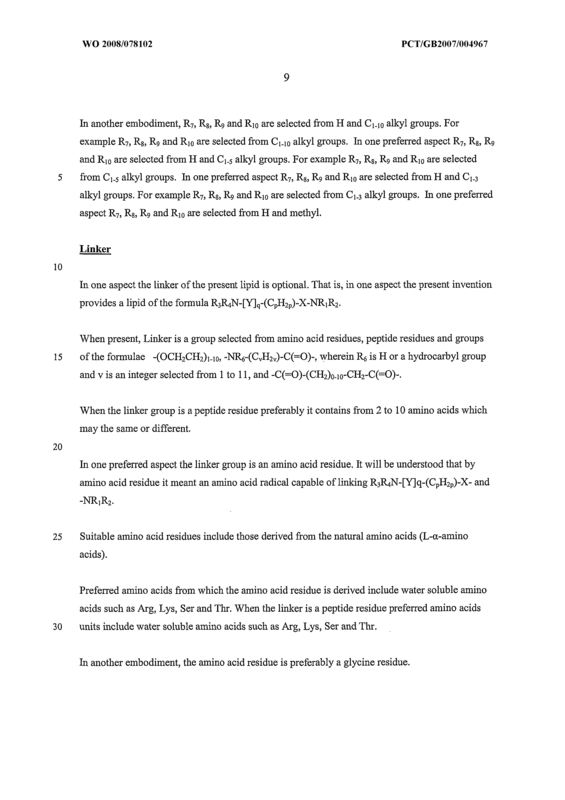 A lipid according to any one of the preceding claims wherein Ri and R2 are each independently selected from alkyl groups having 18 carbon atoms. 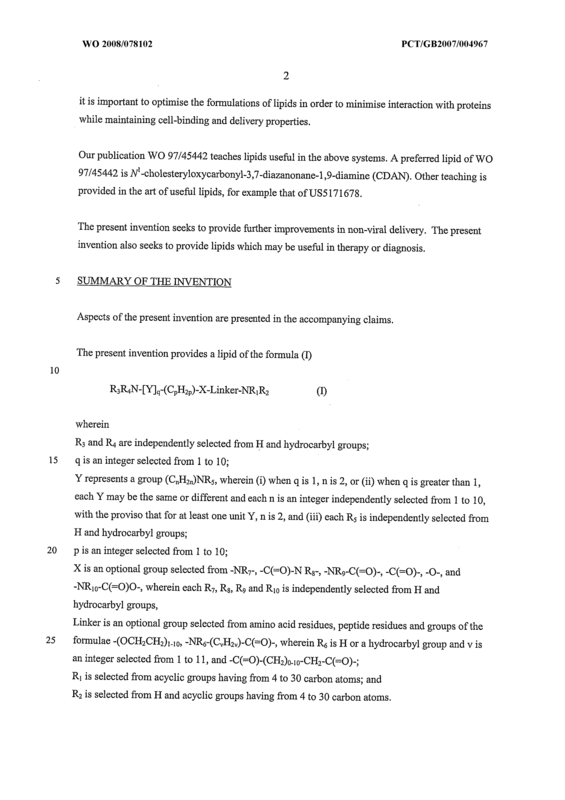 A lipid according to any one of the preceding claims wherein X is present. 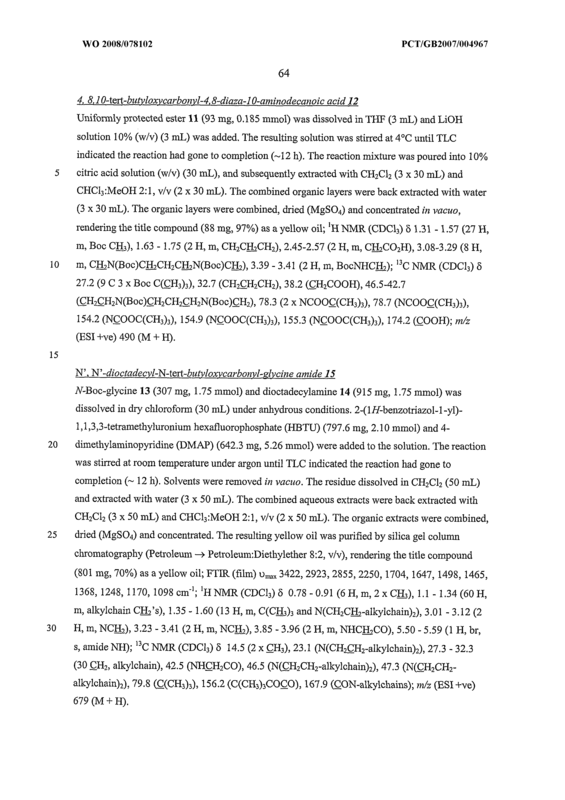 A lipid according to claim 11 wherein X is -C(=O)-. 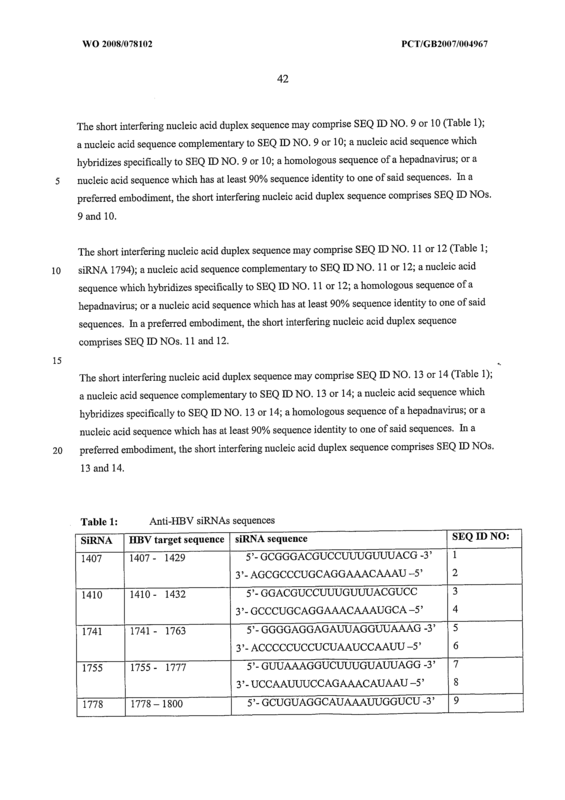 A lipid according to any one of the preceding claims wherein Linker is an amino acid residue, peptide residue or group of the formula -NR6-(CvH2v)-C(=O)-. 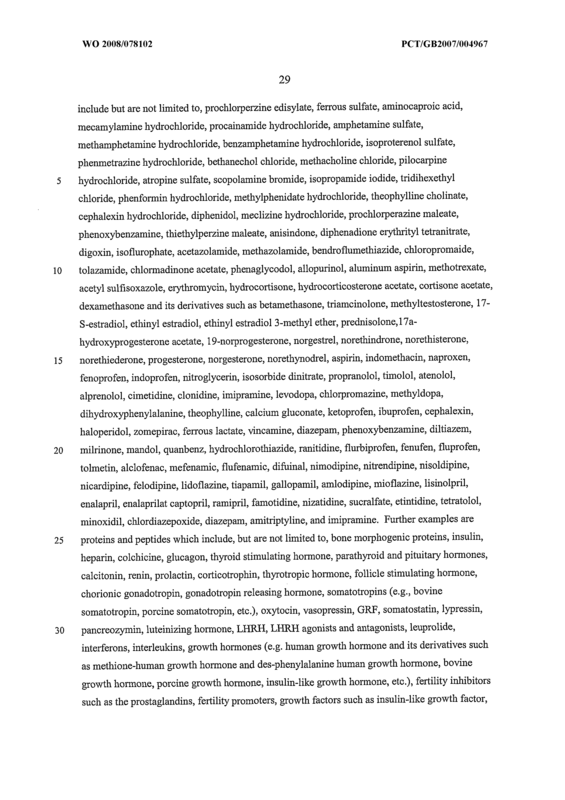 A lipid according to claim 13 wherein Linker is an amino acid residue. 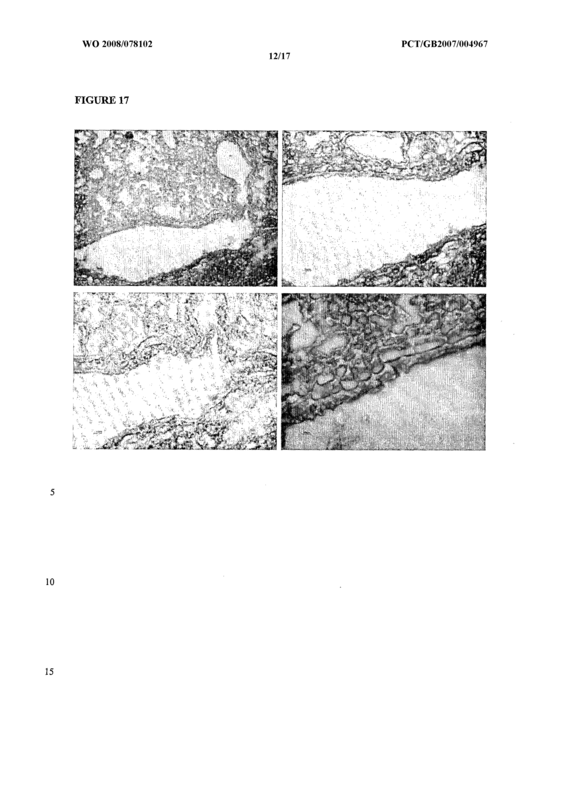 A micelle formed from or comprising a lipid according to any one of claims 1 to 16. 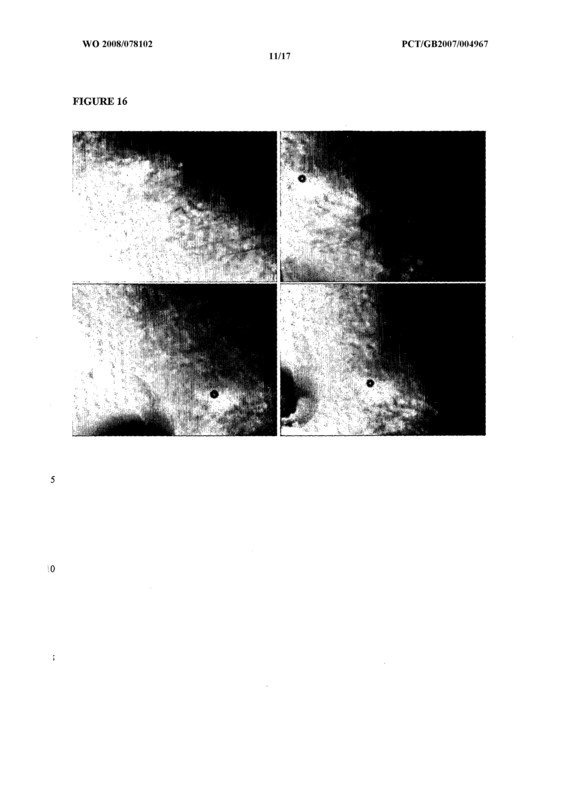 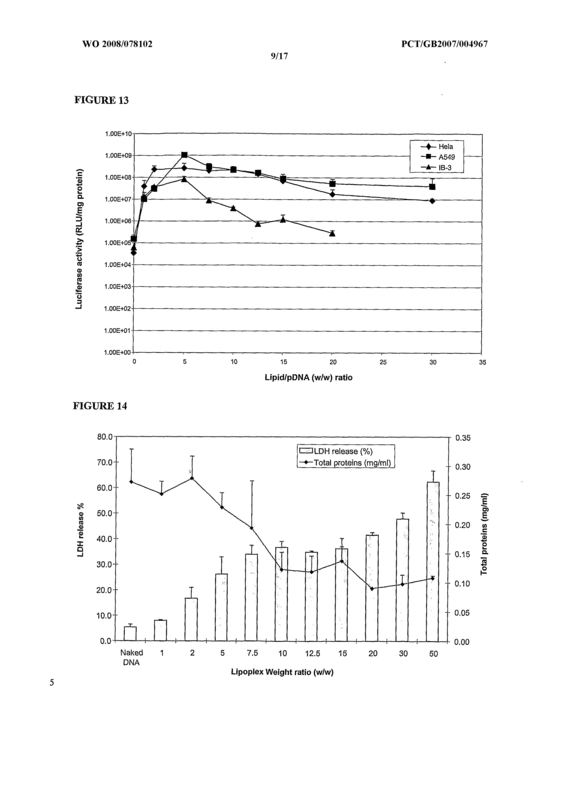 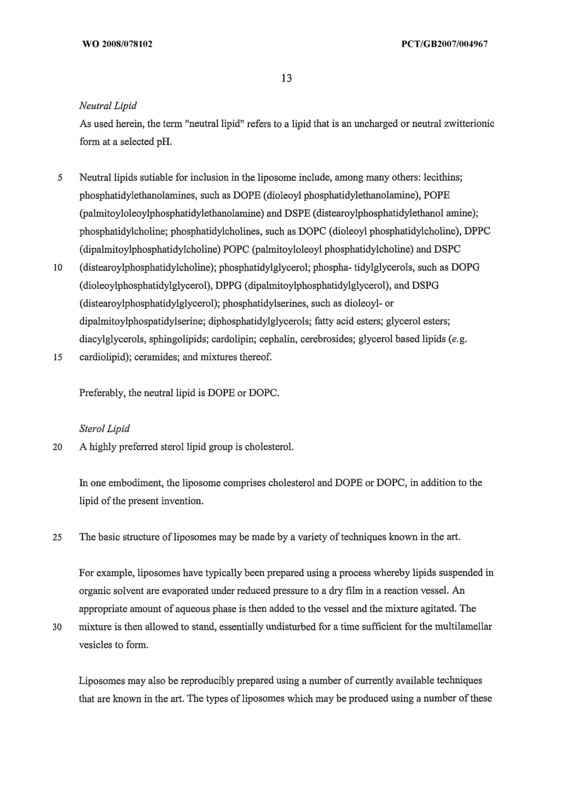 A liposome formed from or comprising a lipid according to any one of claims 1 to 16. 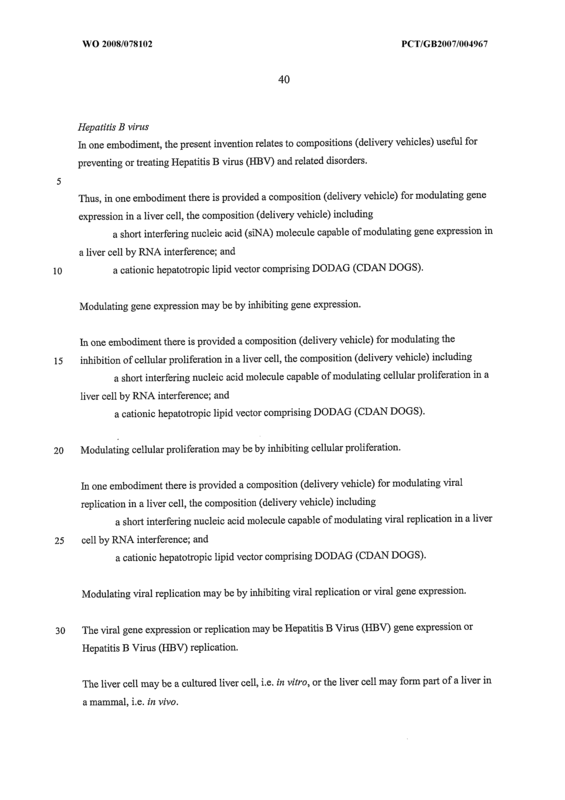 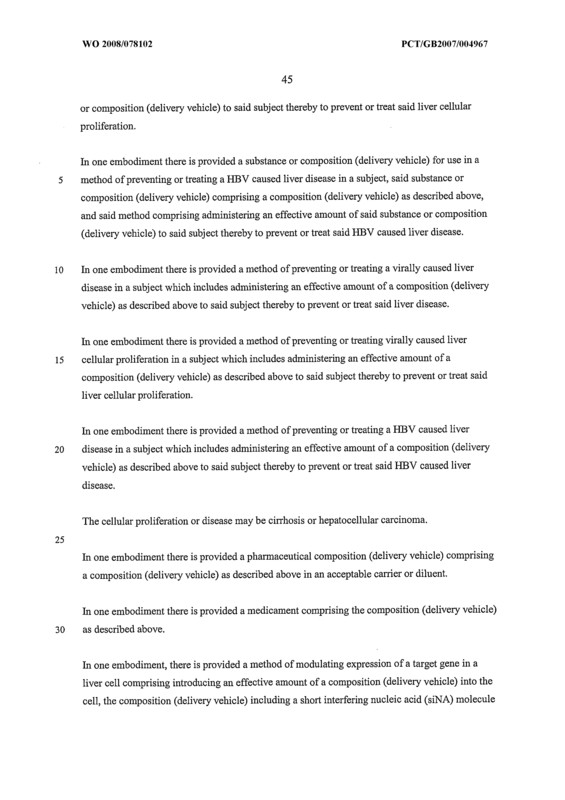 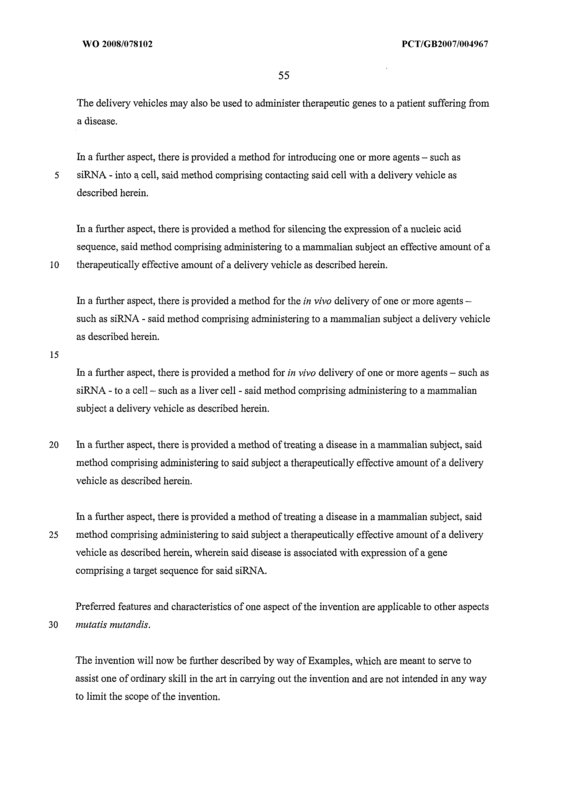 A delivery vehicle comprising (i) a lipid according to any one of claims 1 to 16 and (ii) one or more agents. 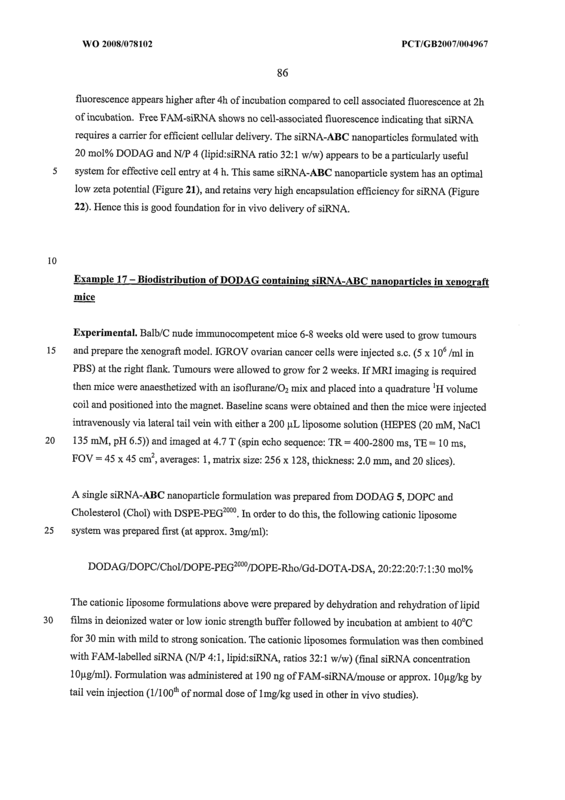 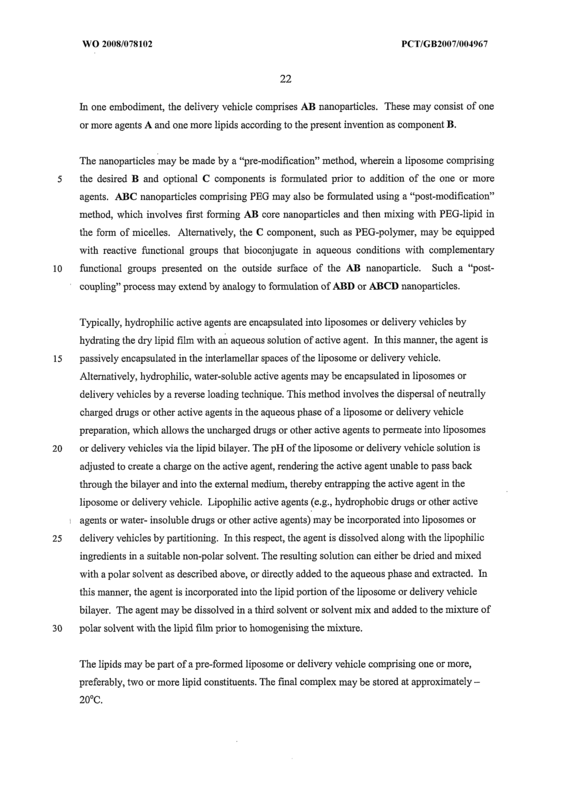 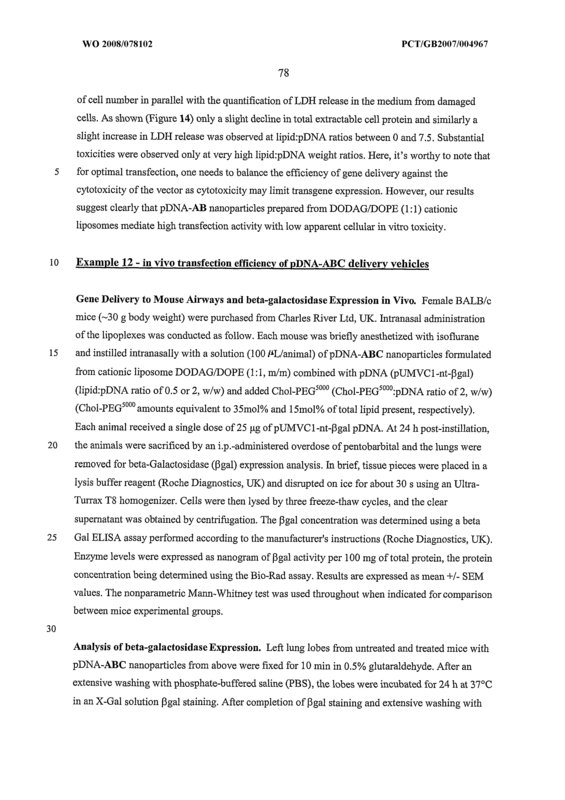 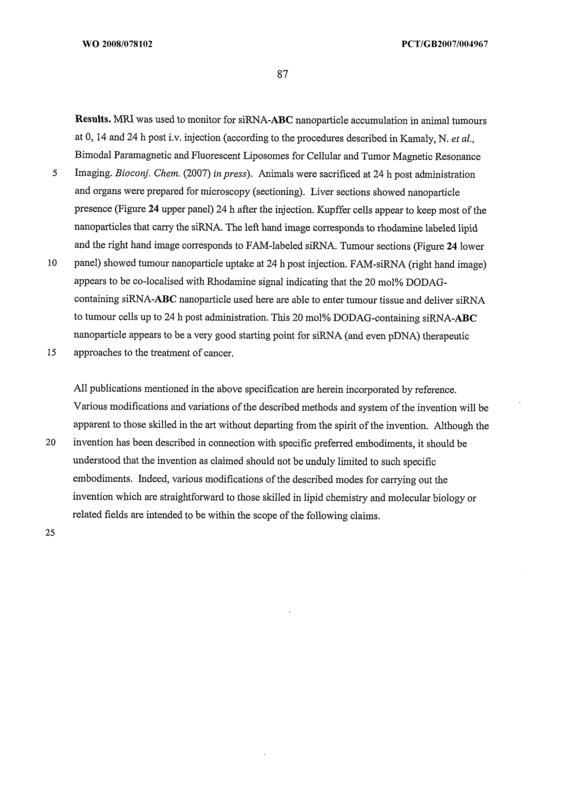 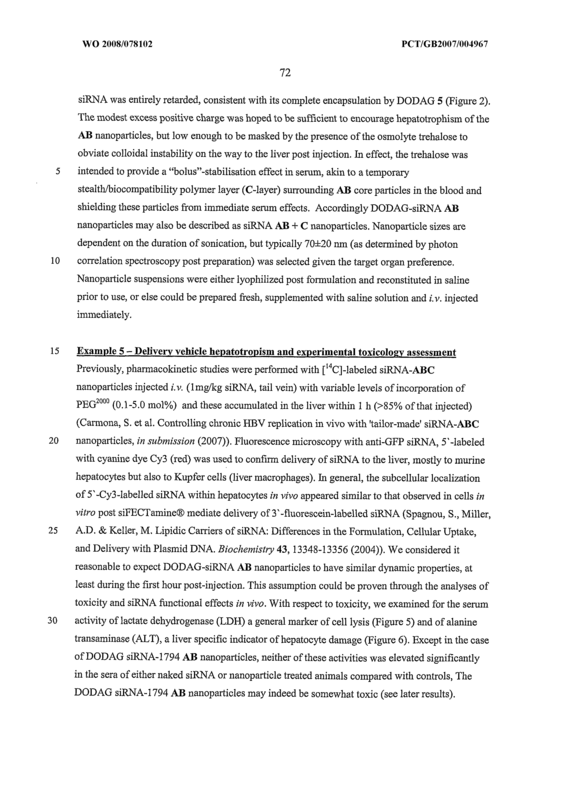 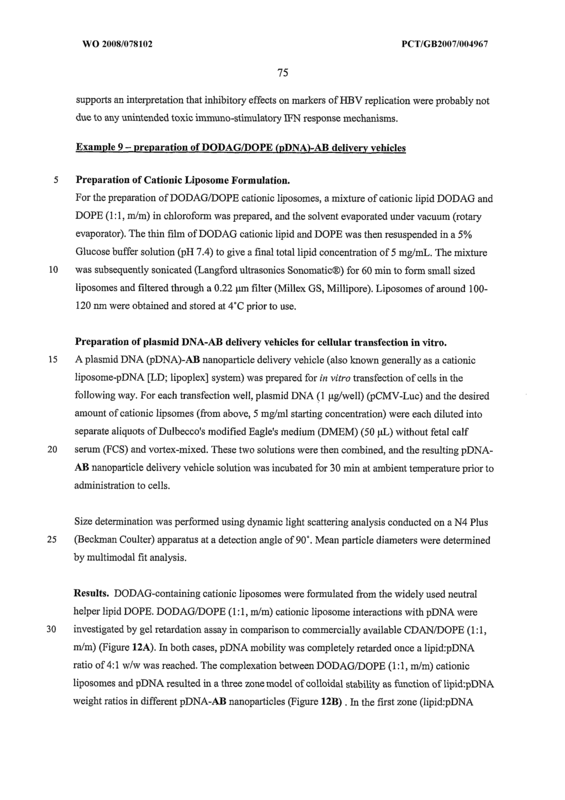 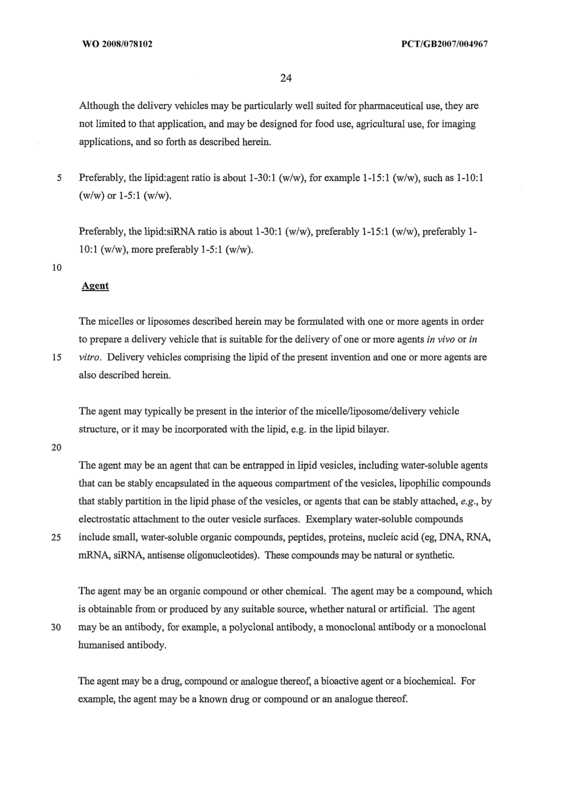 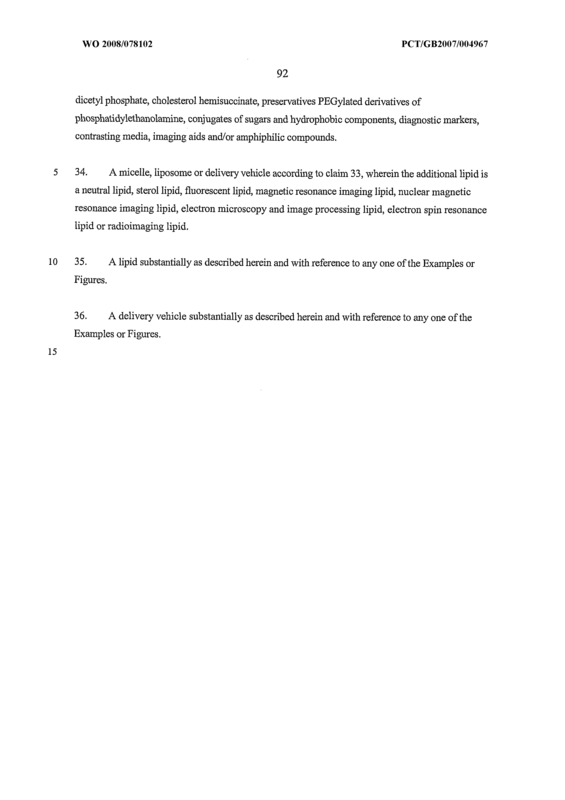 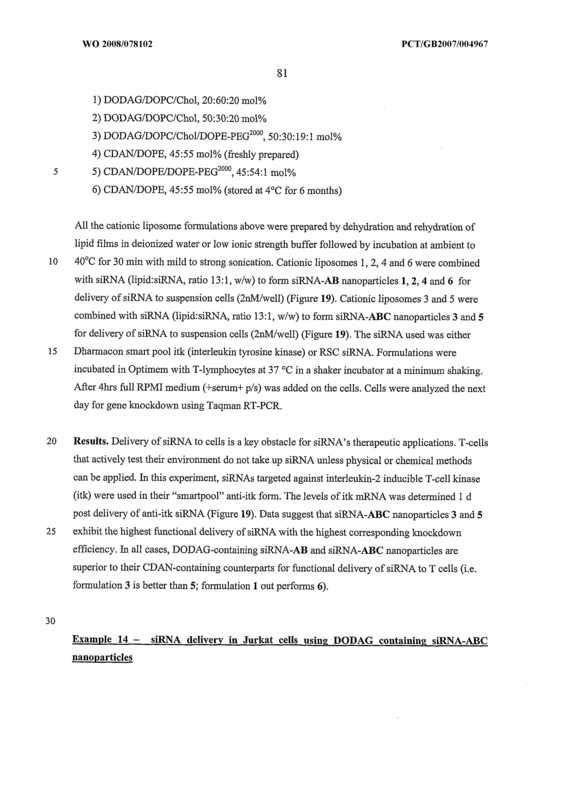 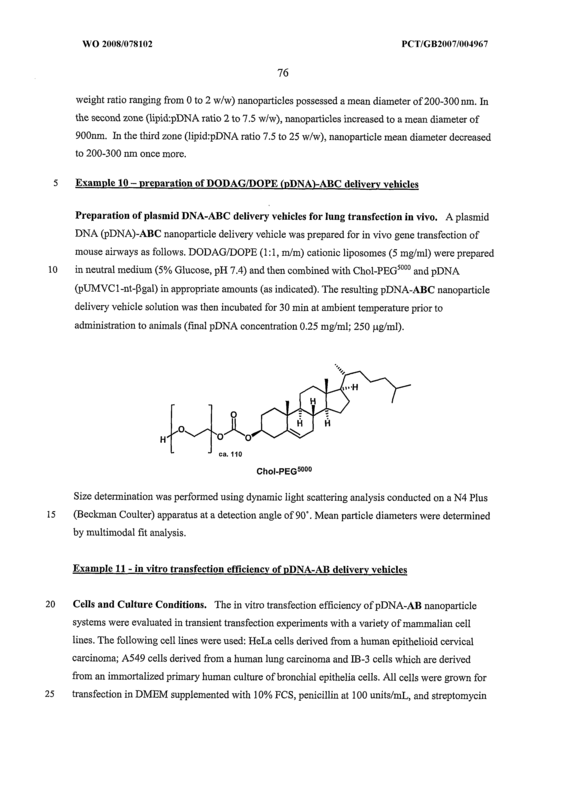 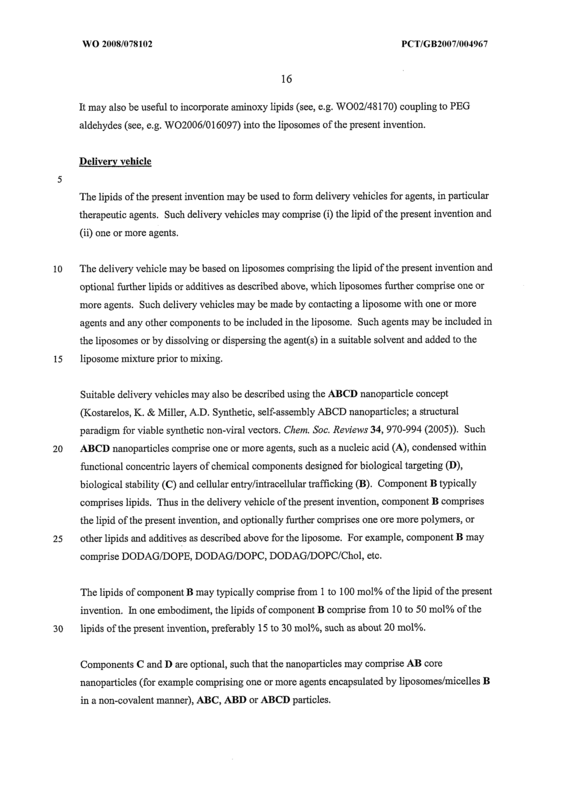 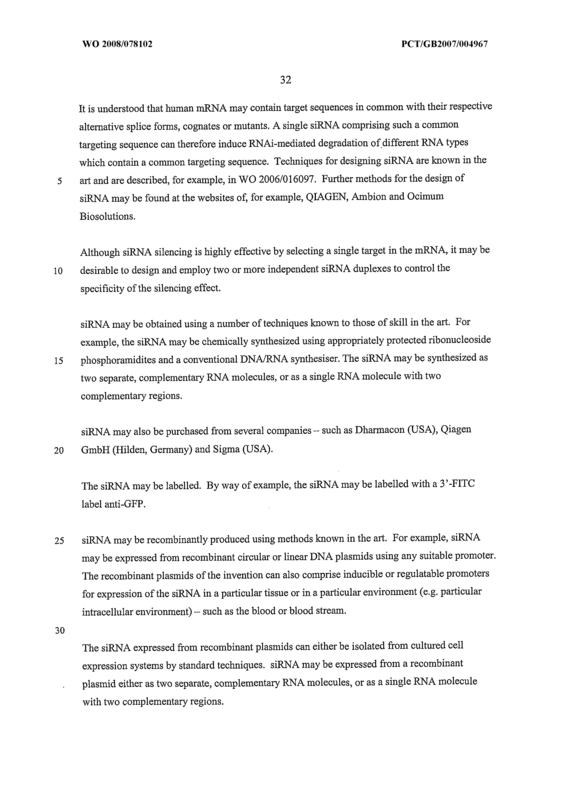 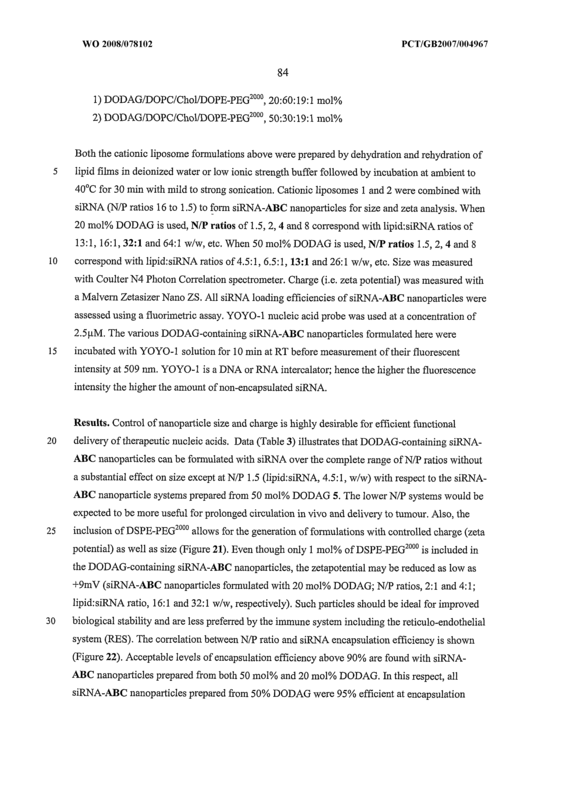 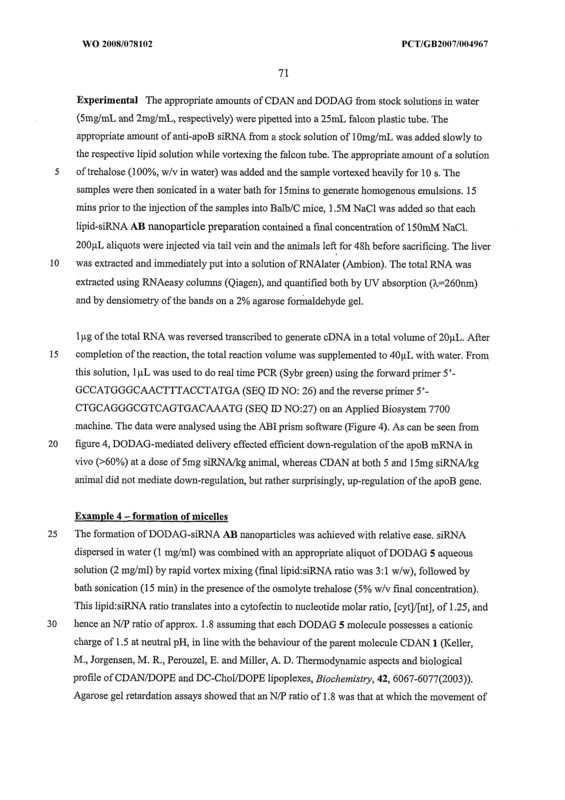 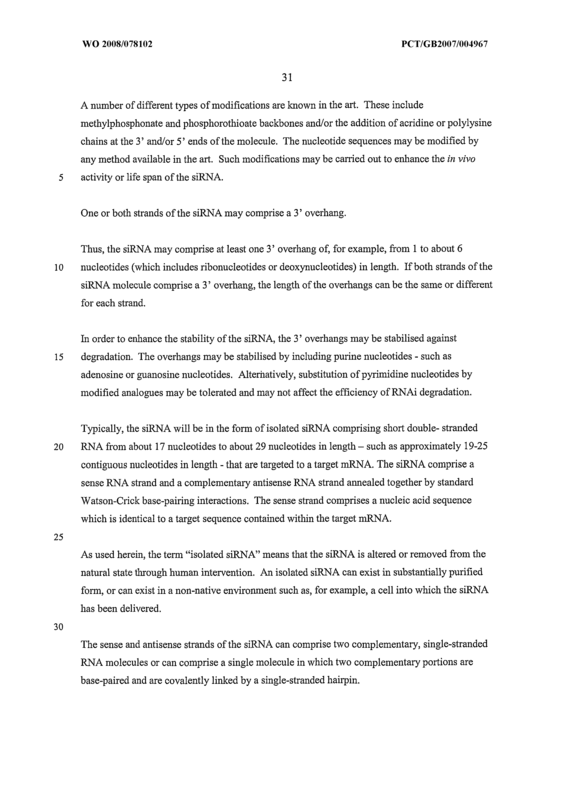 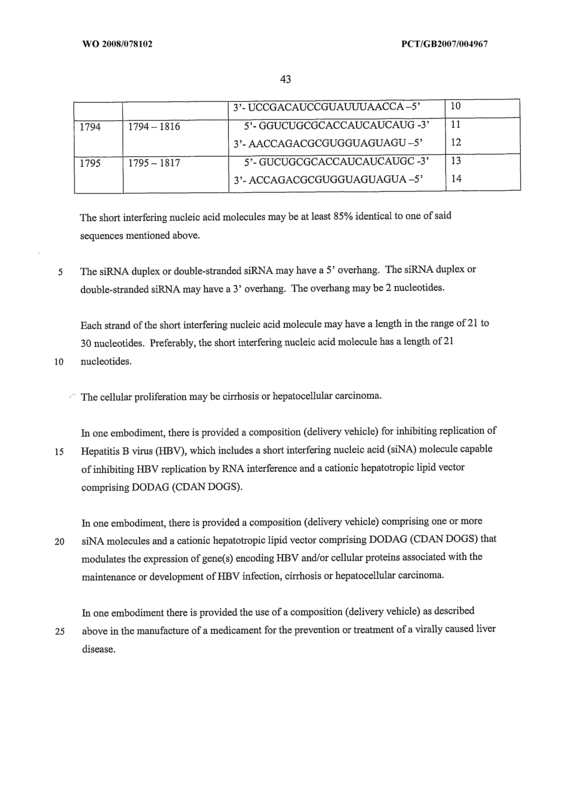 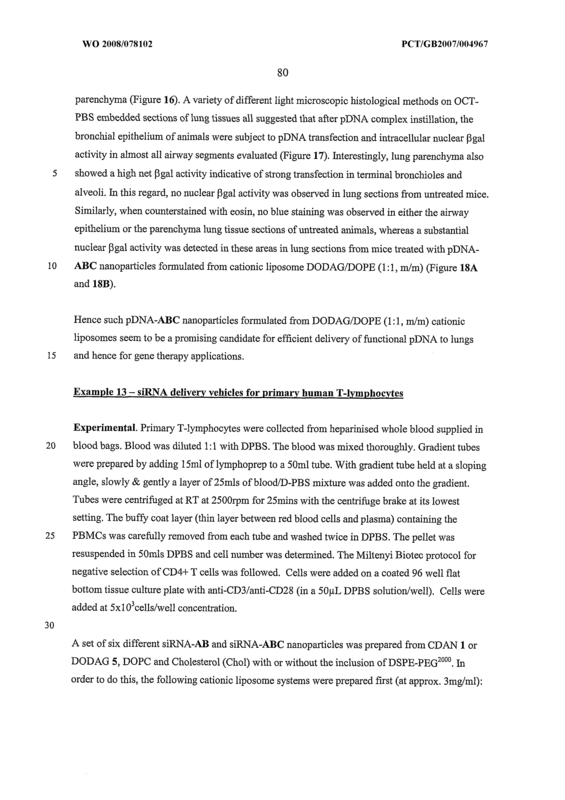 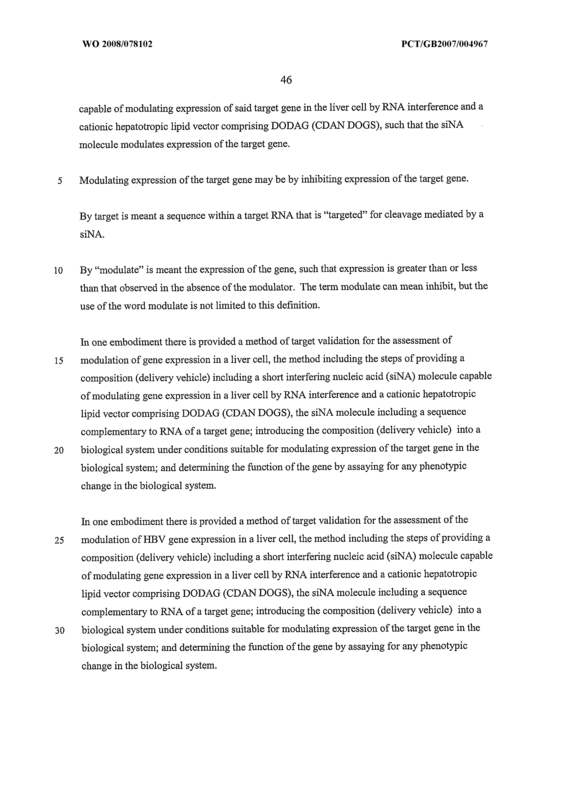 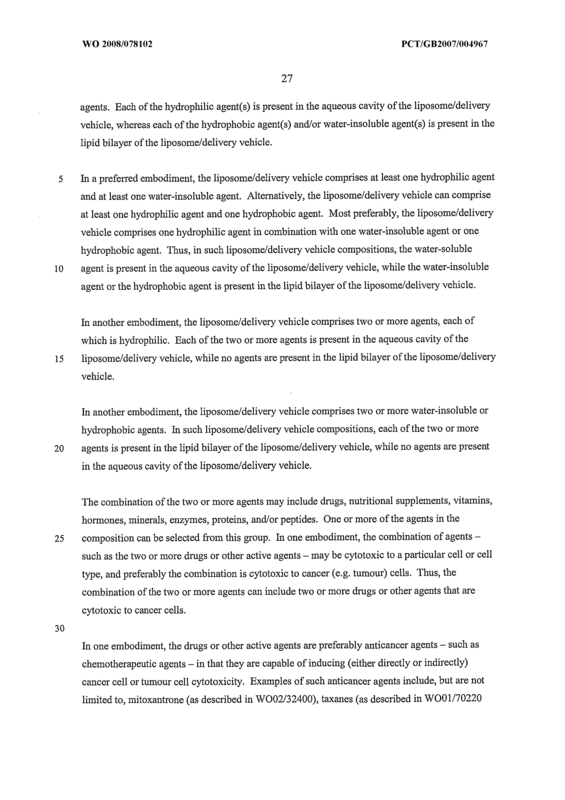 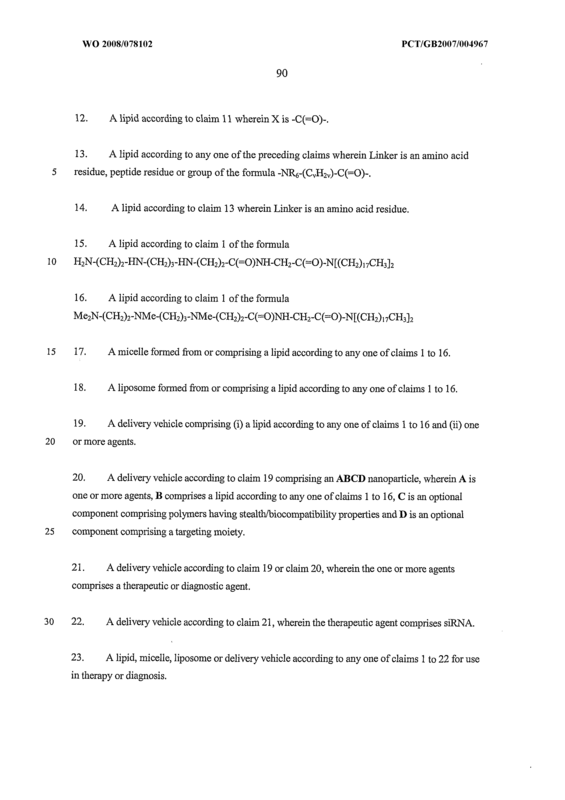 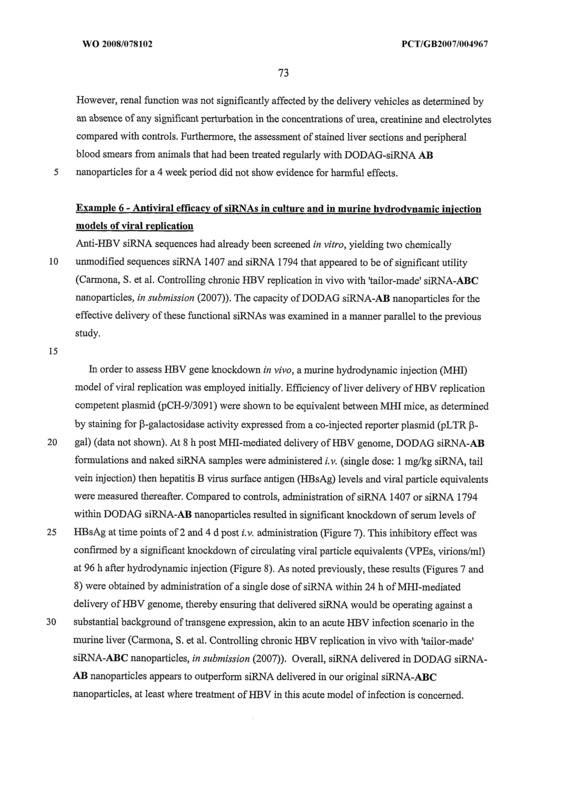 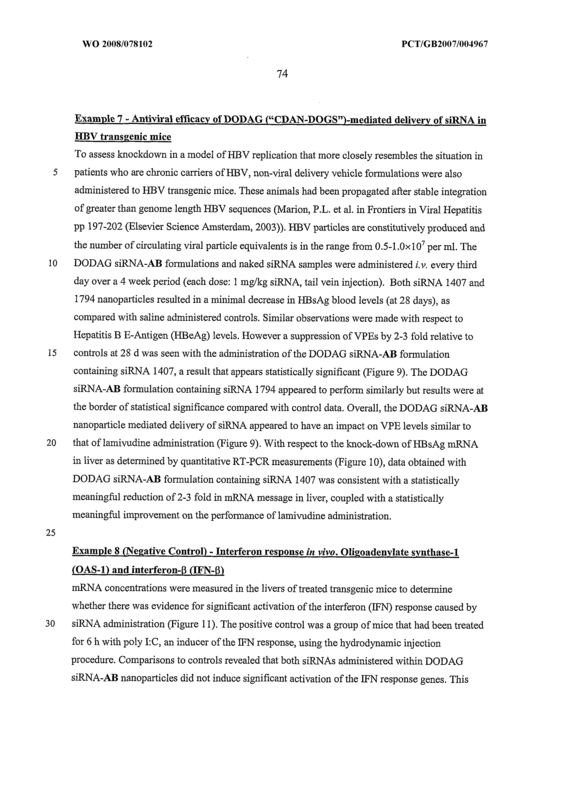 A delivery vehicle according to claim 19 comprising an ABCD nanoparticle, wherein A is one or more agents, B comprises a lipid according to any one of claims 1 to 16, C is an optional component comprising polymers having stealth/biocompatibility properties and D is an optional component comprising a targeting moiety. 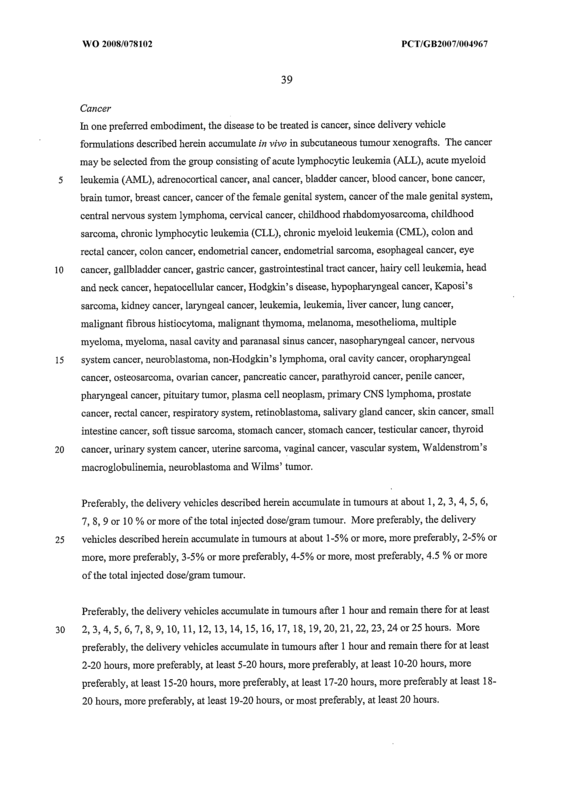 A delivery vehicle according to claim 19 or claim 20, wherein the one or more agents comprises a therapeutic or diagnostic agent. 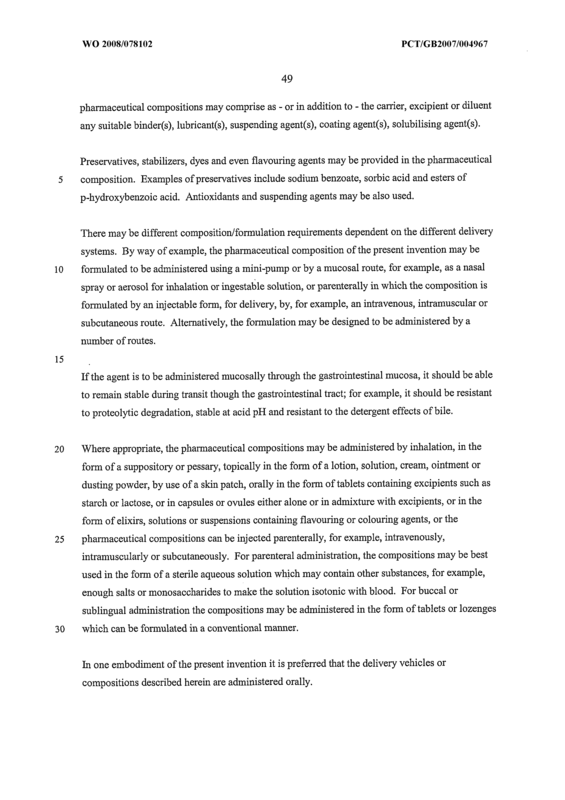 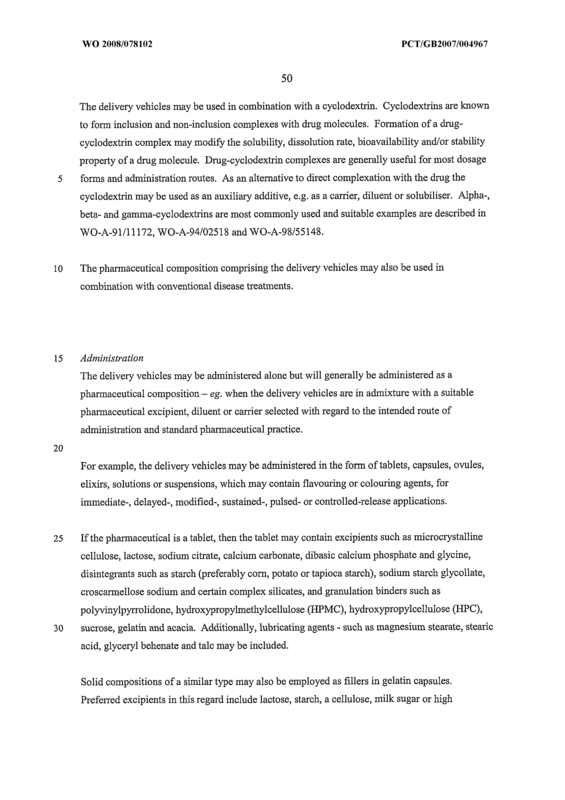 A delivery vehicle according to claim 21 , wherein the therapeutic agent comprises siKNA. 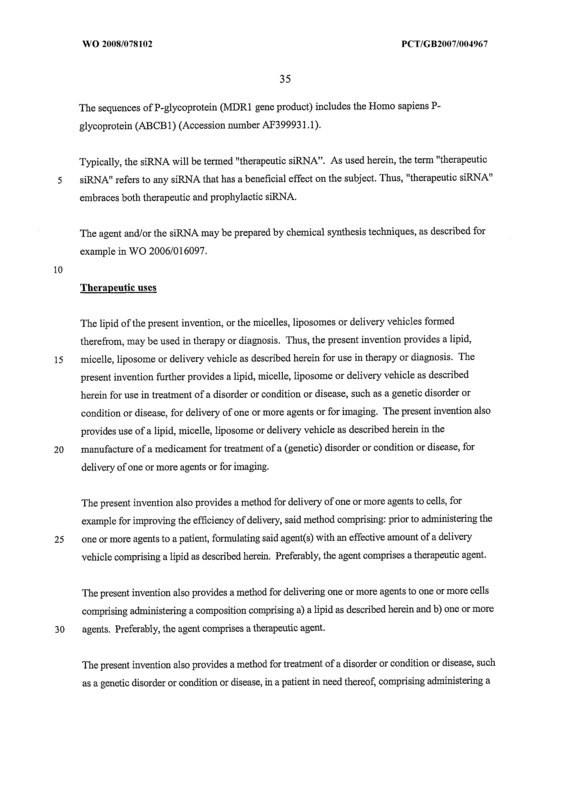 A lipid, micelle, liposome or delivery vehicle according to any one of claims 1 to 22 for use in therapy or diagnosis. 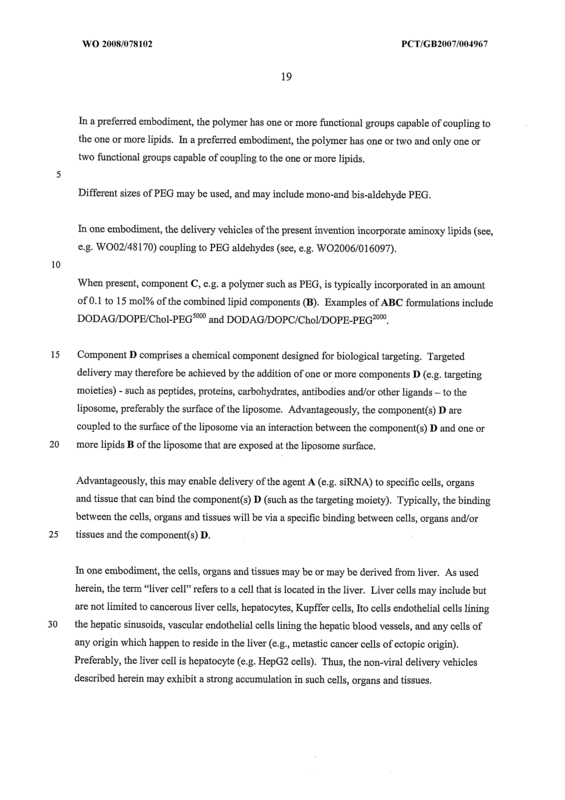 A lipid, micelle, liposome or delivery vehicle according to any one of claims 1 to 22 for use in treatment or diagnosis of a (e.g. 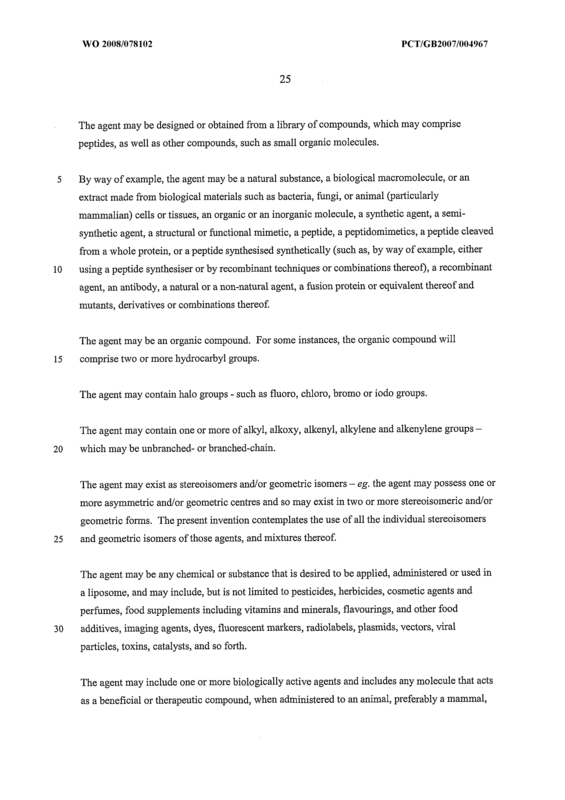 genetic) disorder or condition or disease, for delivery of one or more agents or for imaging. 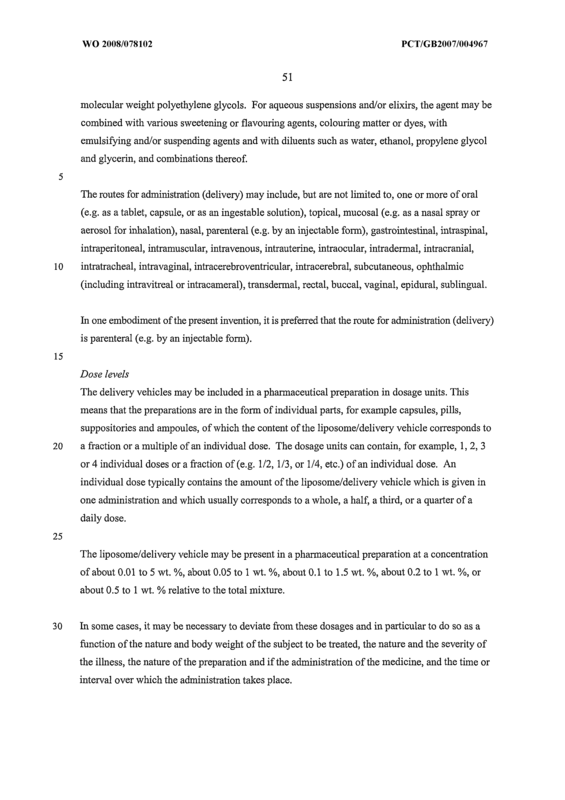 Use of a lipid, micelle, liposome or delivery vehicle according to any one of claims 1 to 22 in the manufacture of a medicament for the treatment or diagnosis of a (e.g. 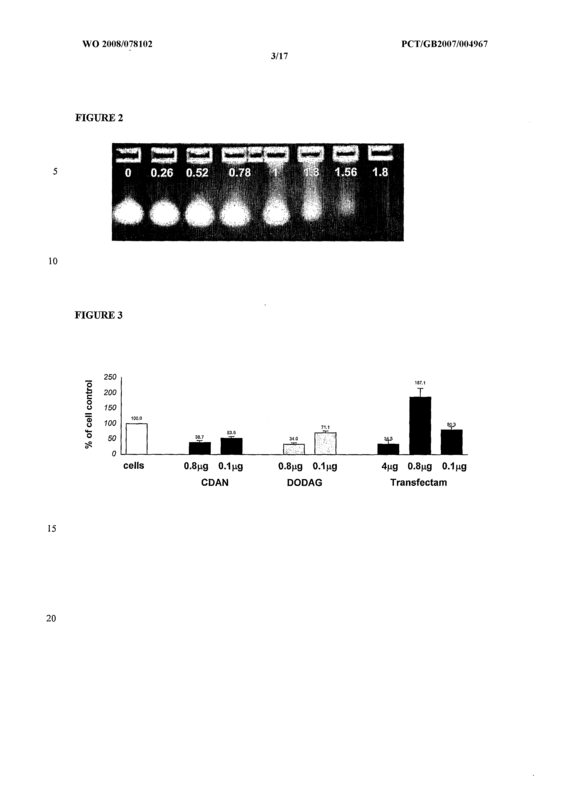 genetic) disorder or condition or disease, for delivery of one or more agents or for imaging. 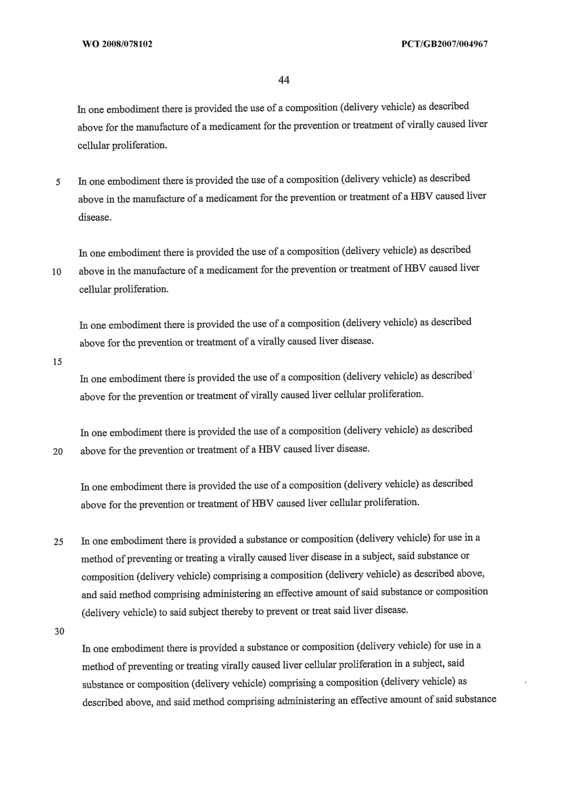 Use according to claim 24 or claim 25, wherein the (e.g.) 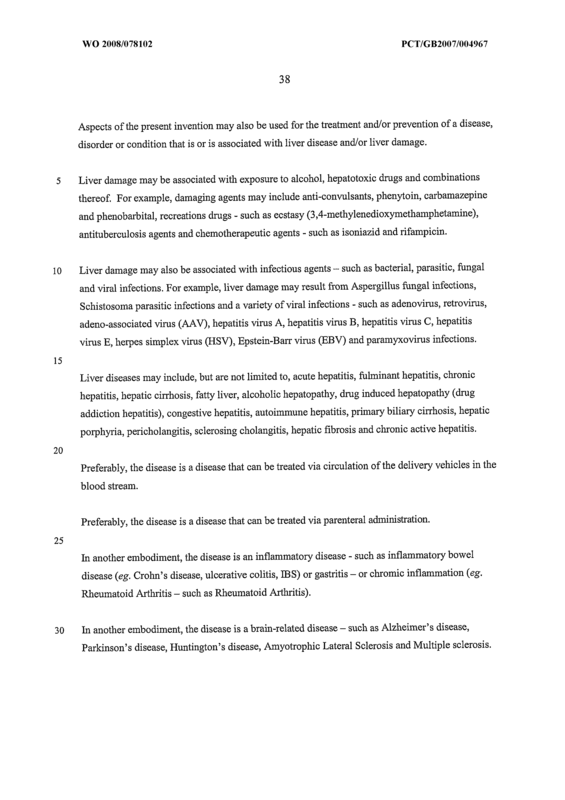 genetic disorder or condition or disease is selected from a disease, disorder or condition that is associated with liver disease and/or liver damage, and cancer. 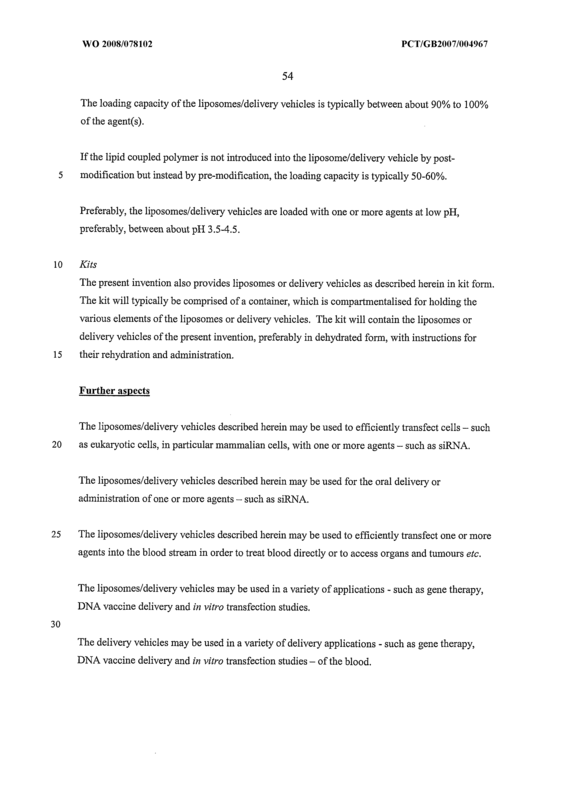 A method for delivery of one or more agents to one ore more cells, comprising: prior to administering the one or more agents to a patient, formulating said agent(s) with an effective amount of a delivery vehicle comprising a lipid according to any one of claims 1 to 16. 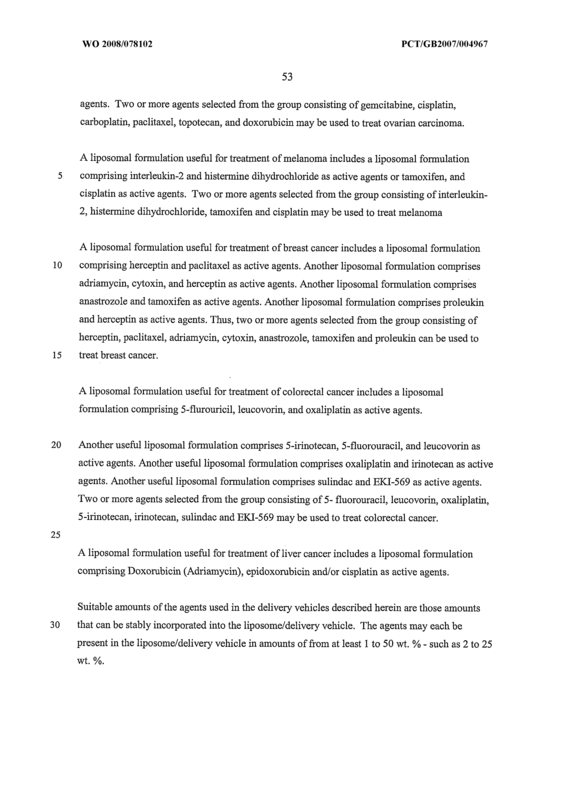 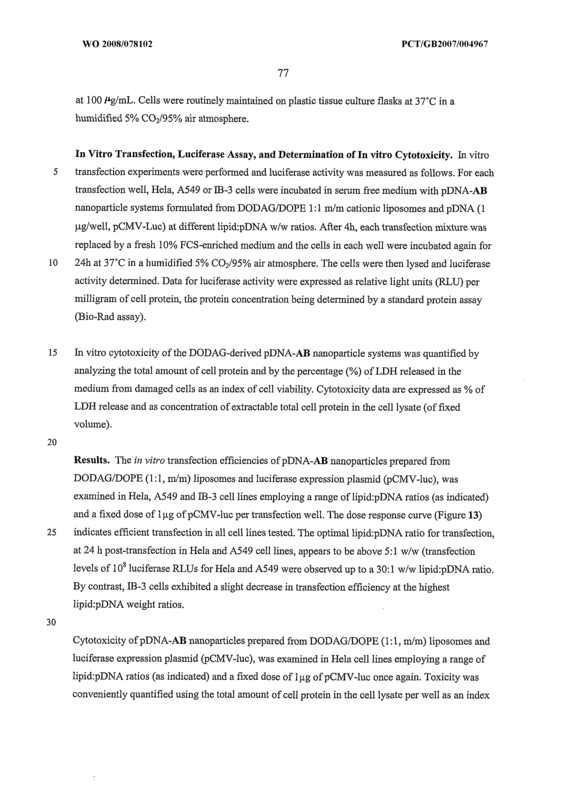 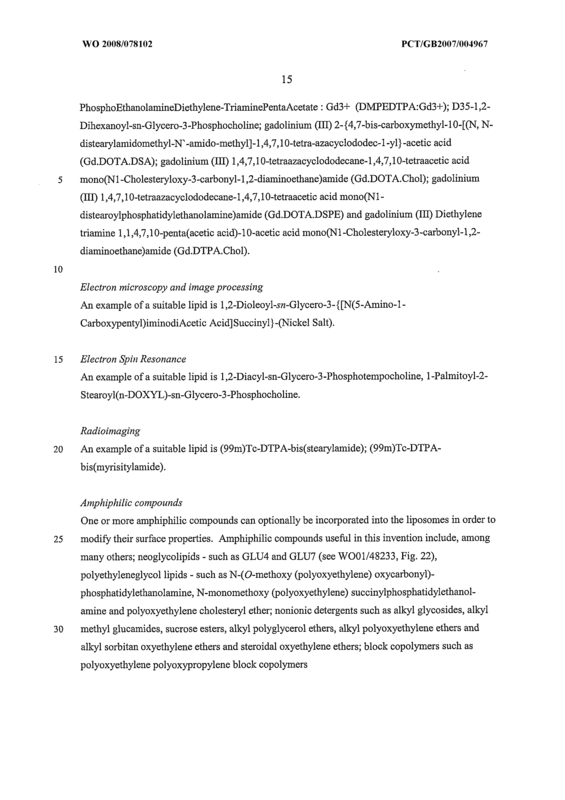 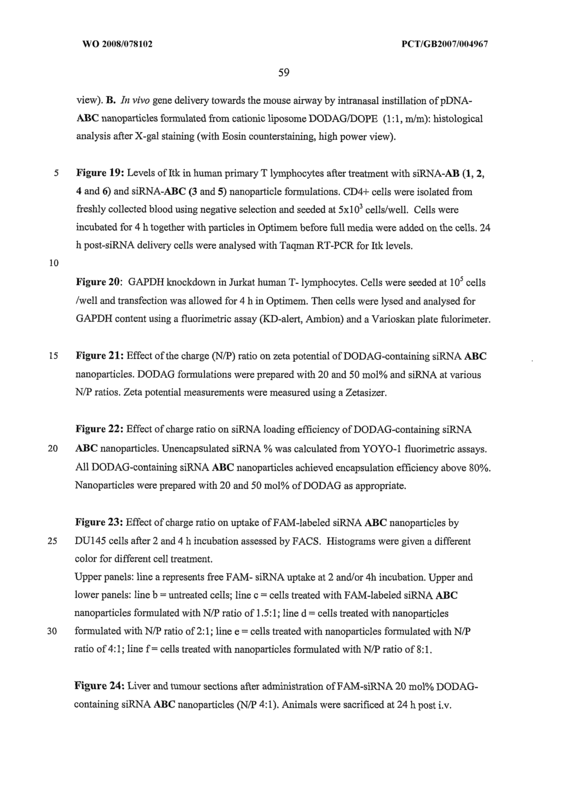 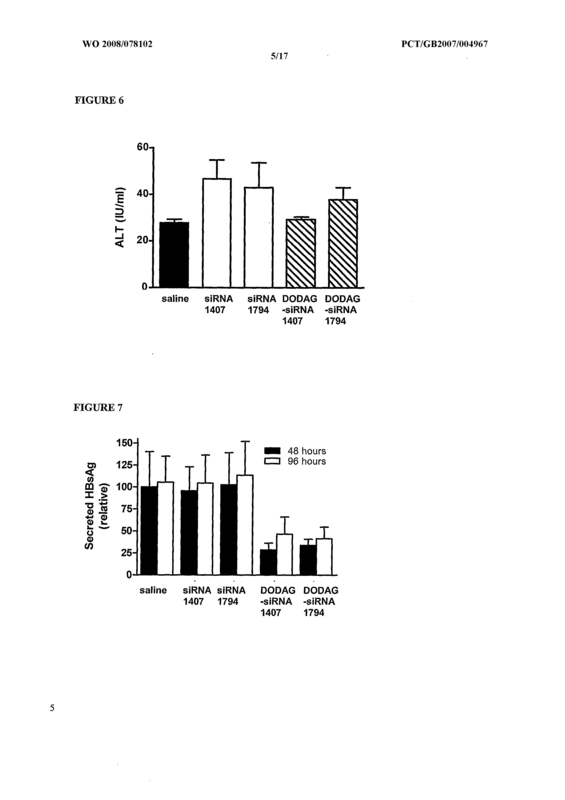 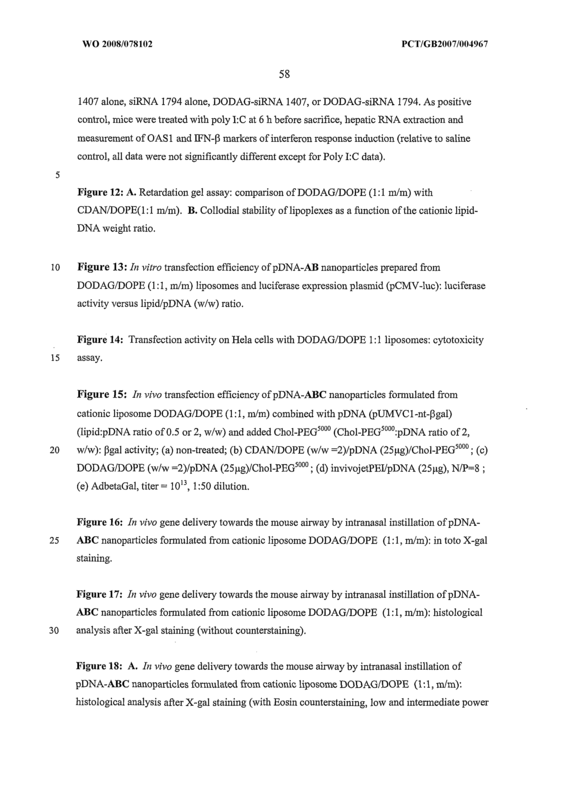 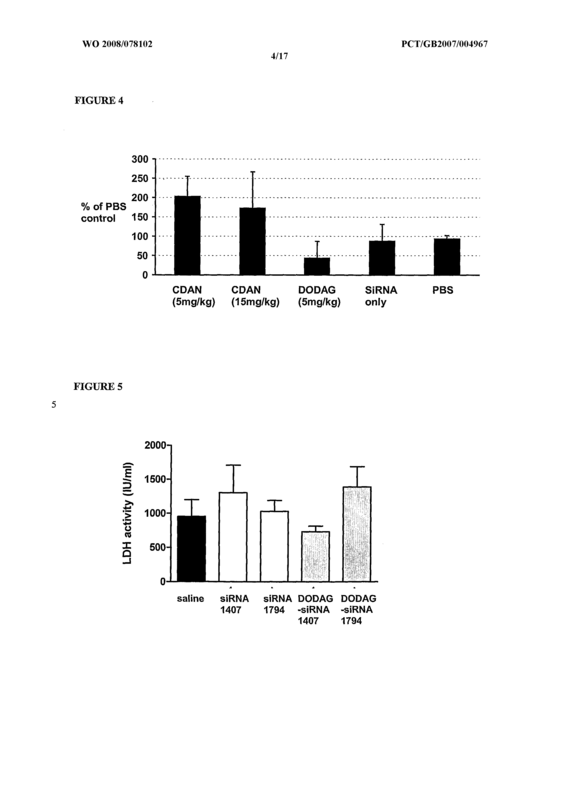 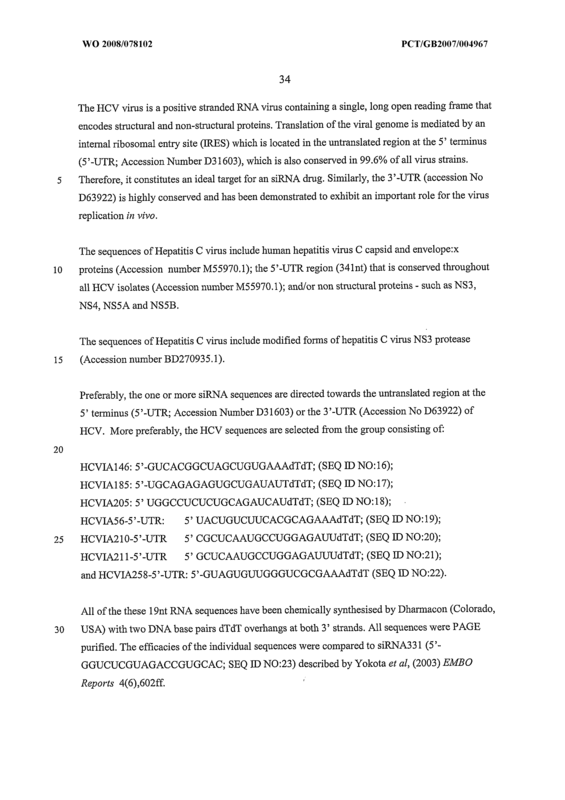 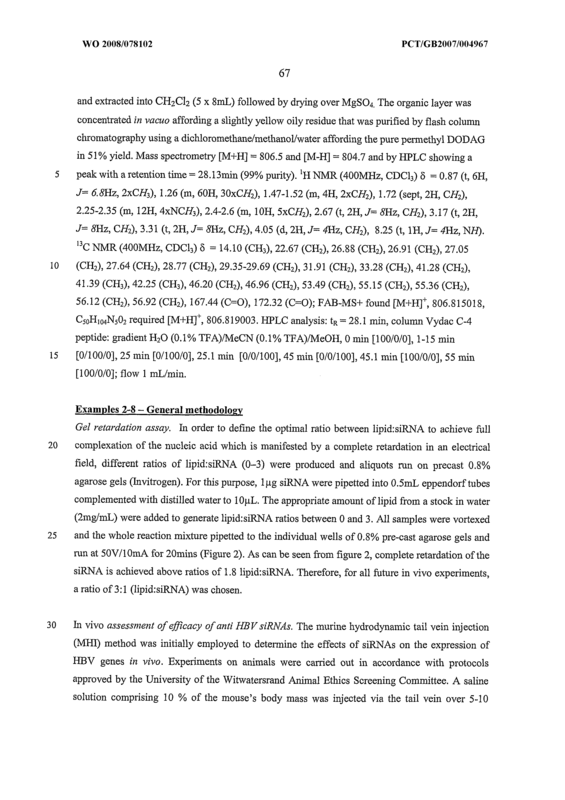 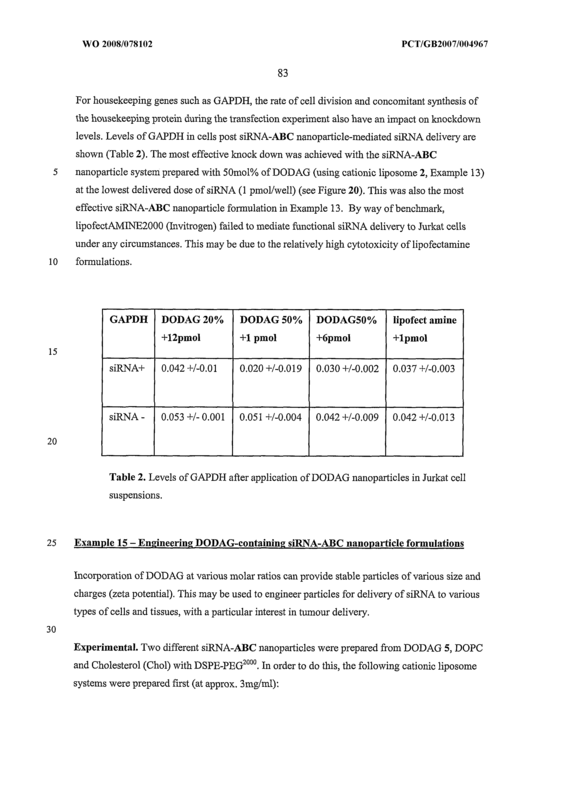 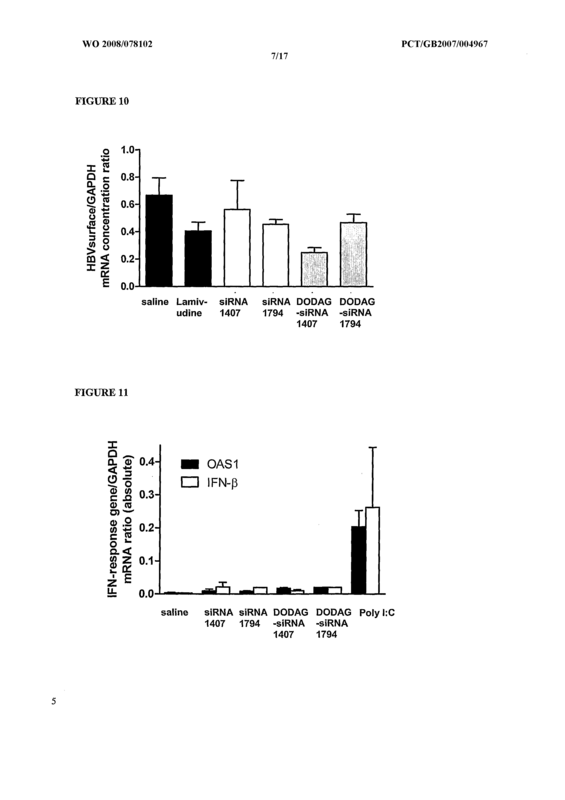 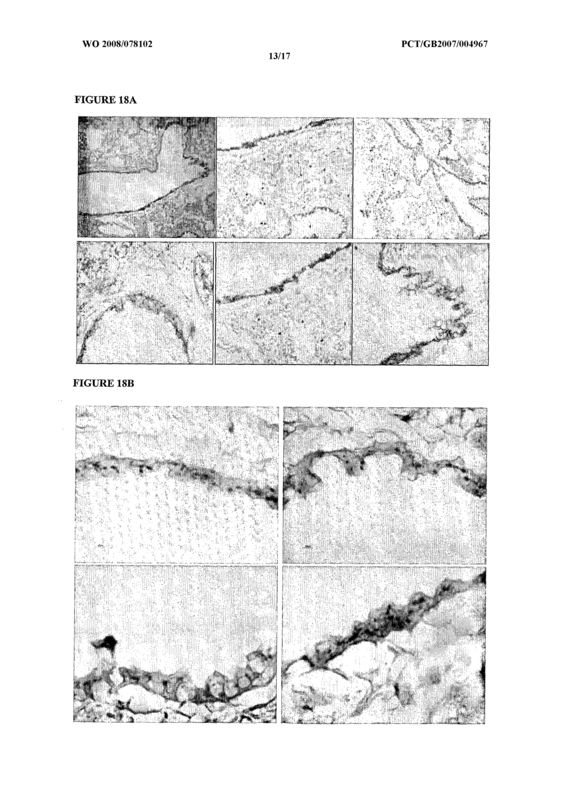 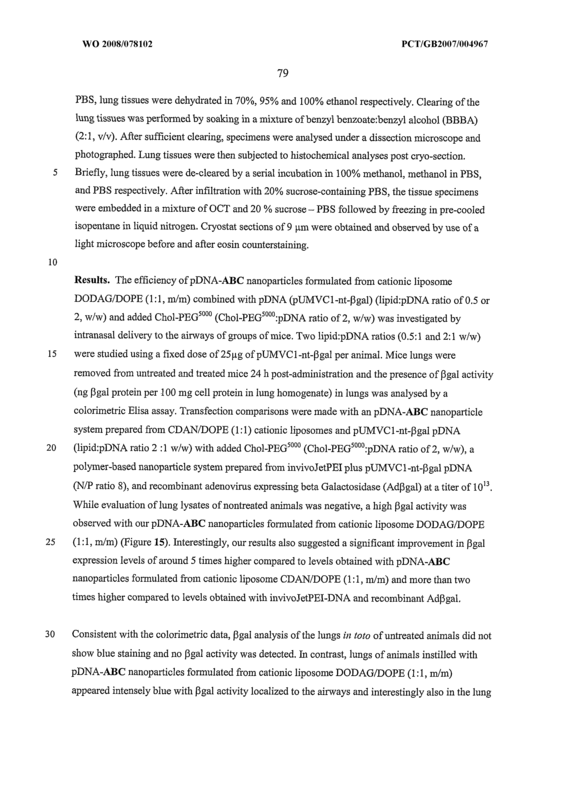 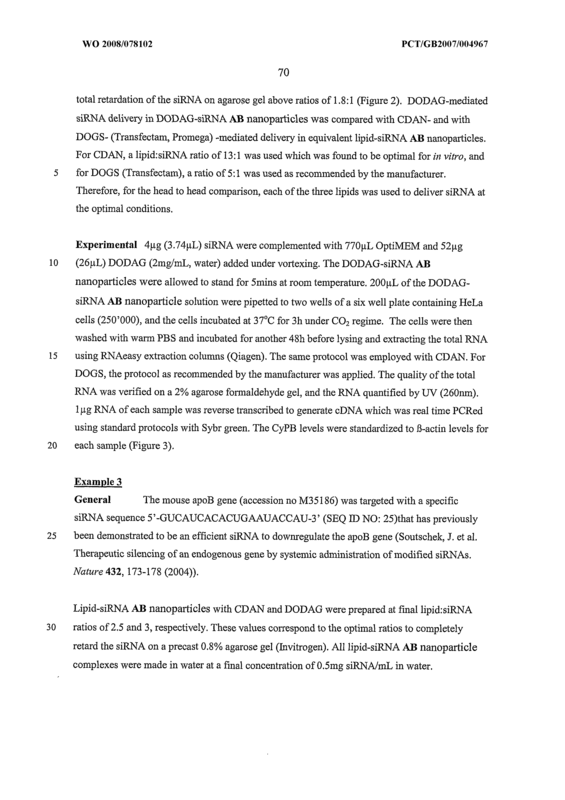 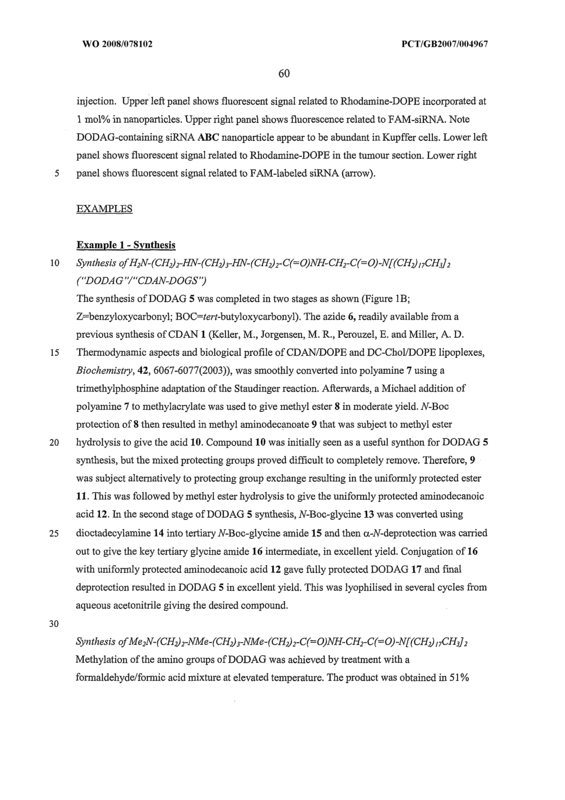 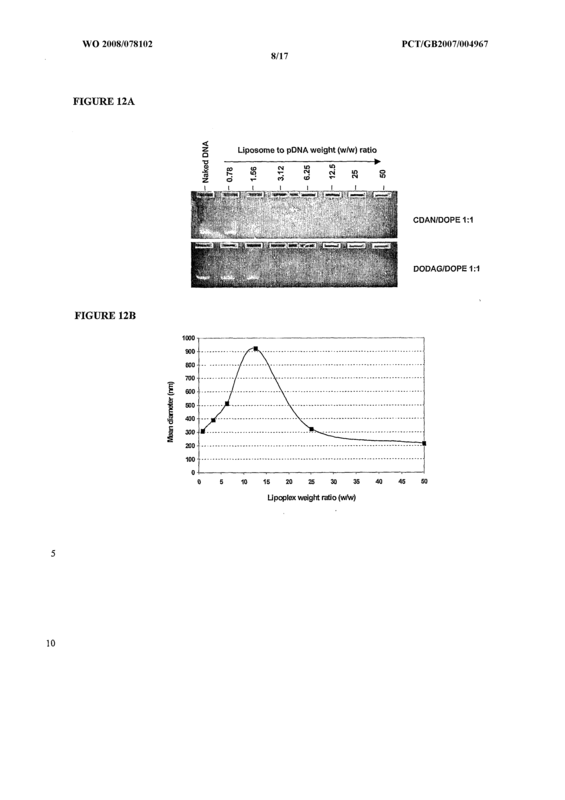 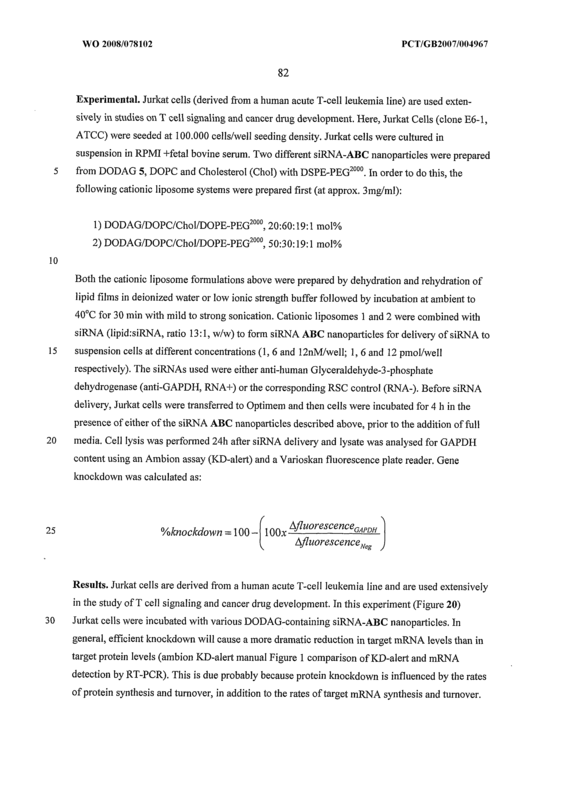 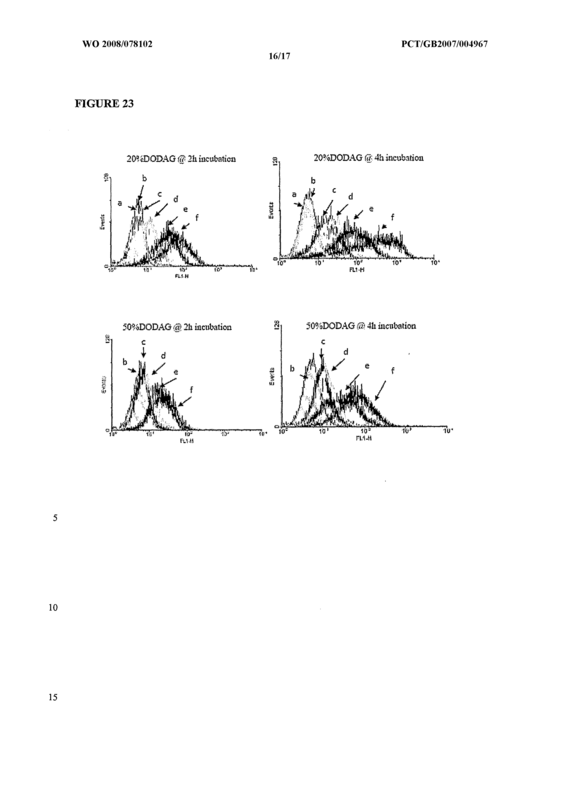 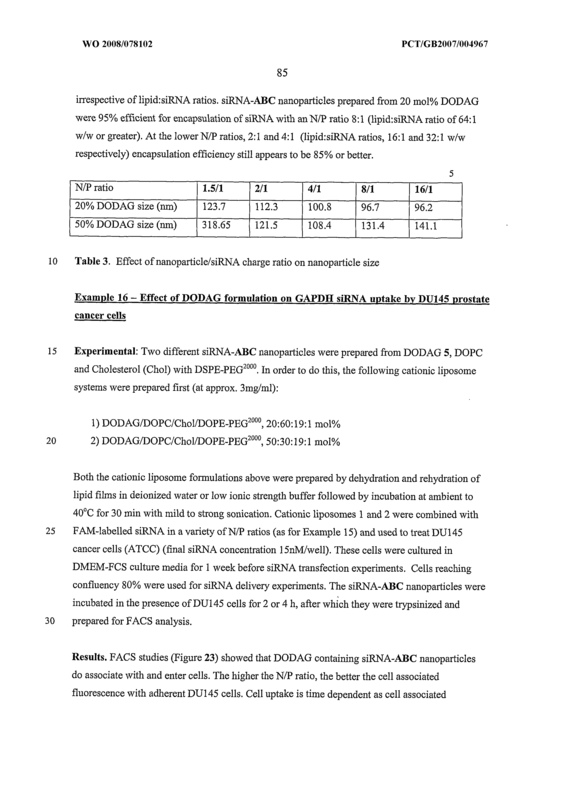 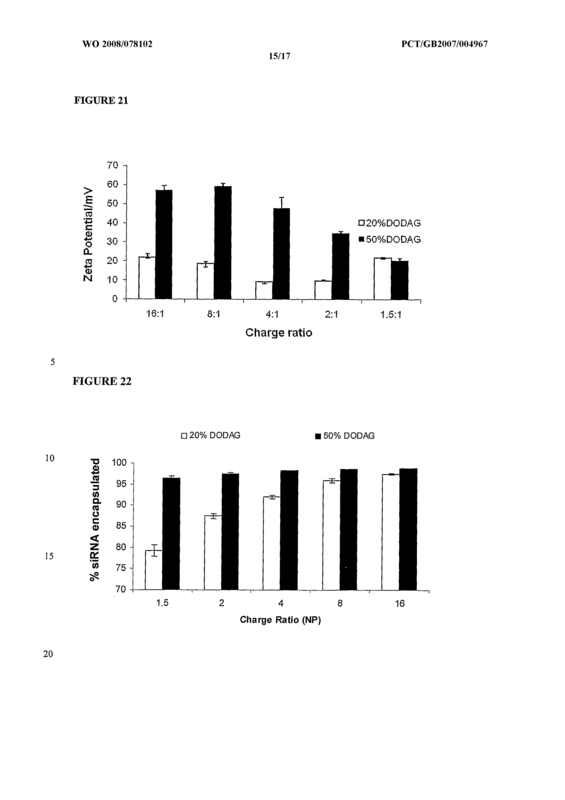 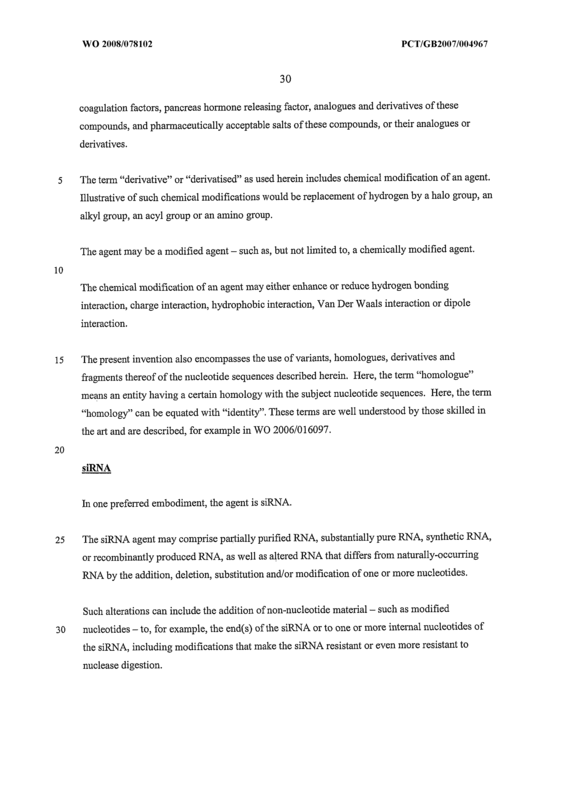 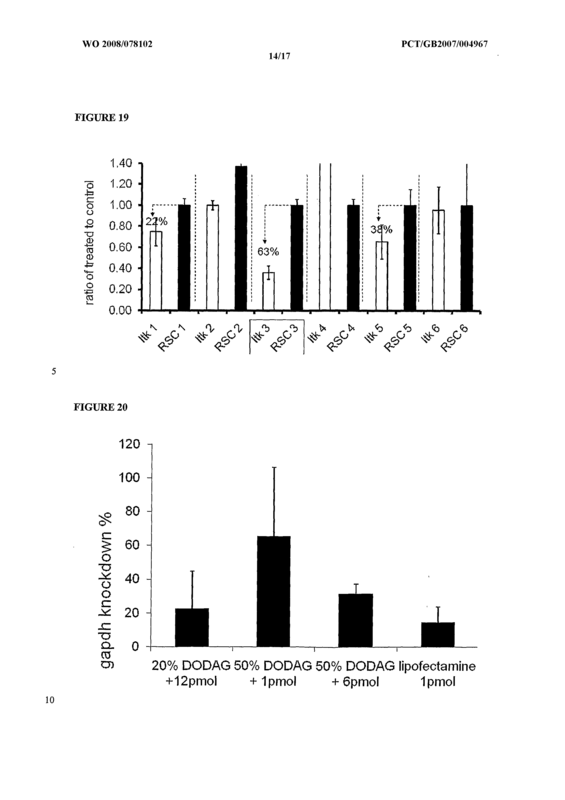 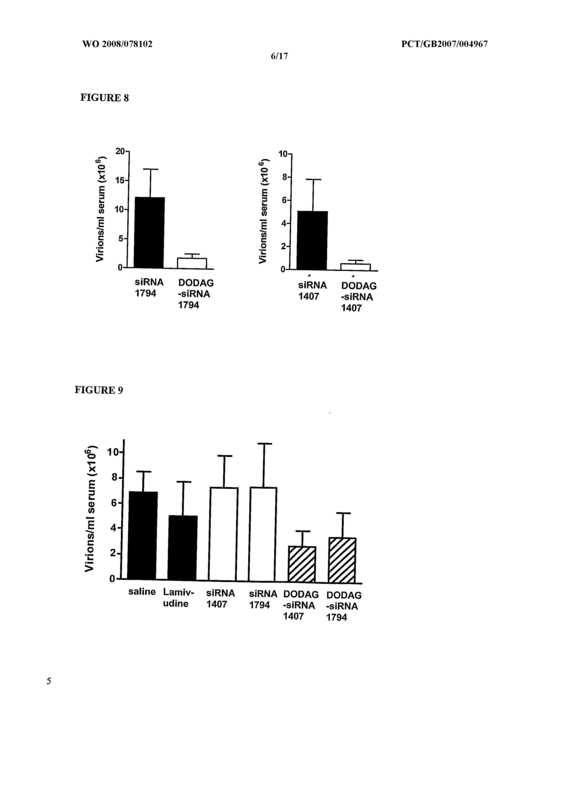 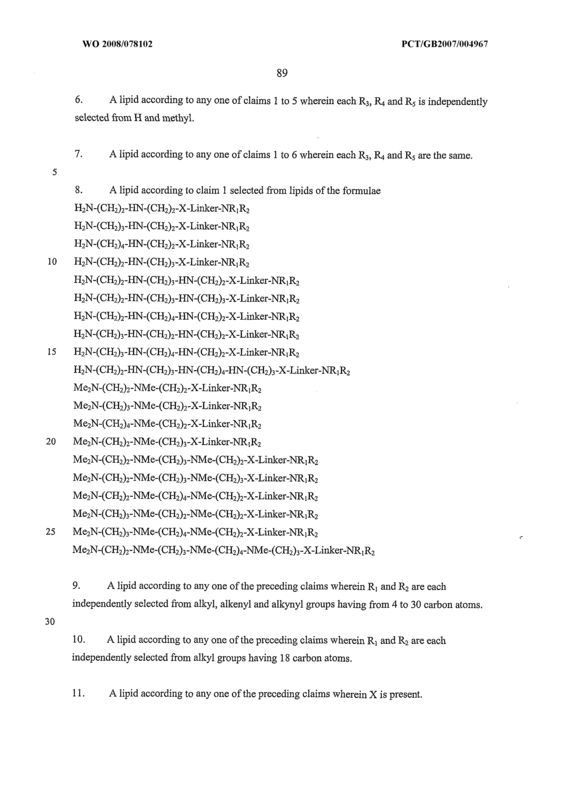 A method for delivering one or more agents to one or more cells comprising administering a composition comprising a) a lipid according to any one of claims 1 to 16 and b) one or more agents. 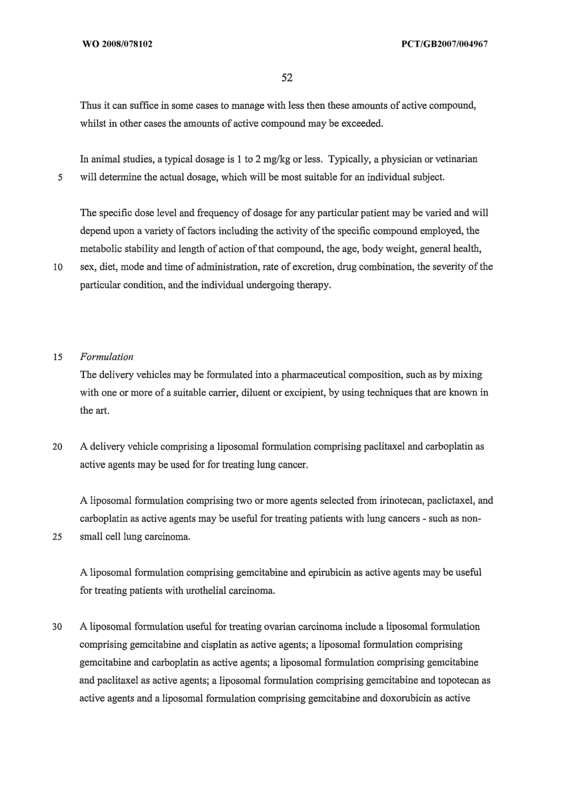 A method for treatment of a (e.g. 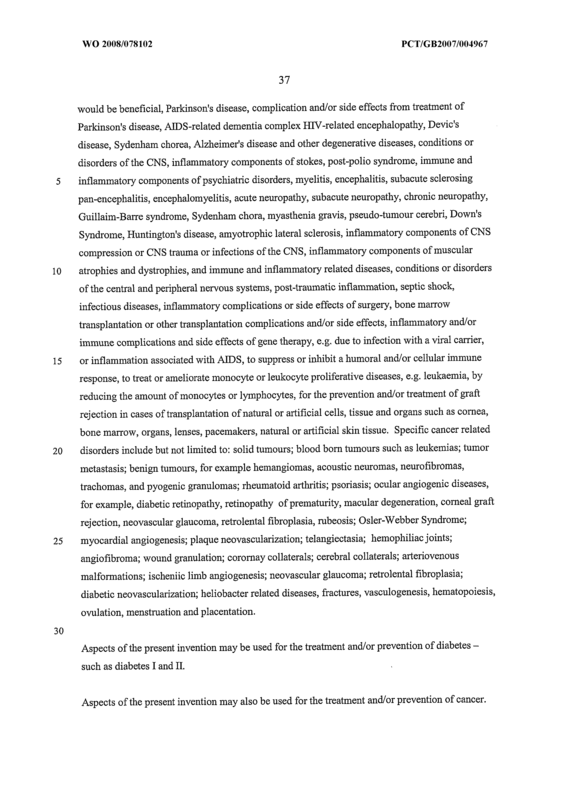 genetic) disorder or condition or disease in a patient in need thereof, comprising administering a pharmaceutical composition comprising a) a lipid according to any one of claims 1 to 16 and b) one or more agents. 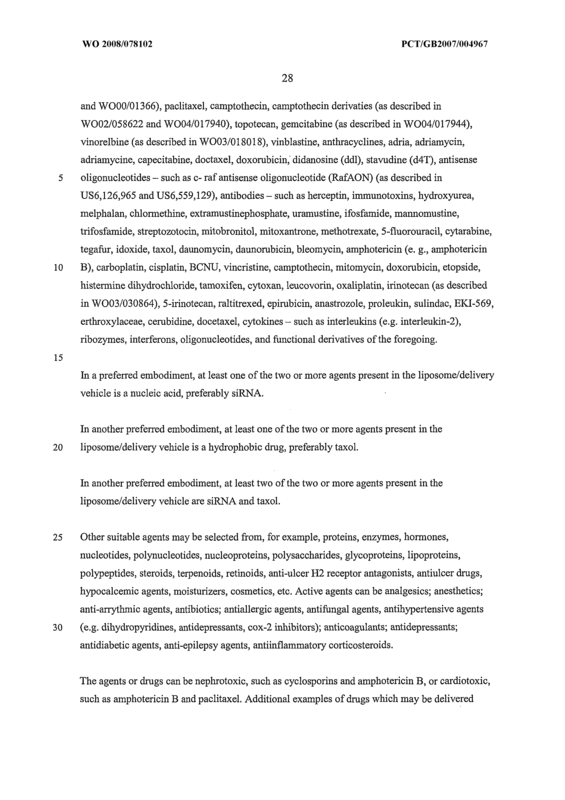 A method according to any one of claims 27 to 29, wherein the one or more agents comprise a therapeutic agent. 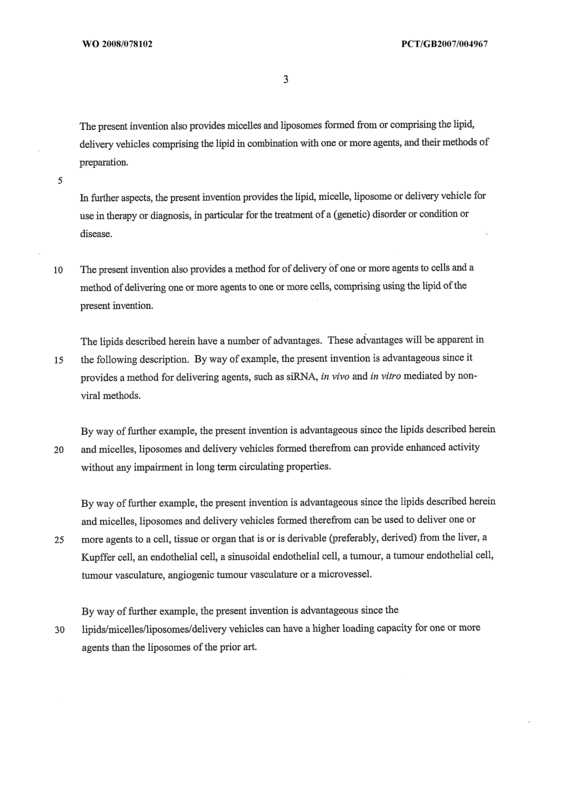 Use of a lipid according to any one of claims 1 to 16 for preparing a micelle, a liposome or a delivery vehicle. 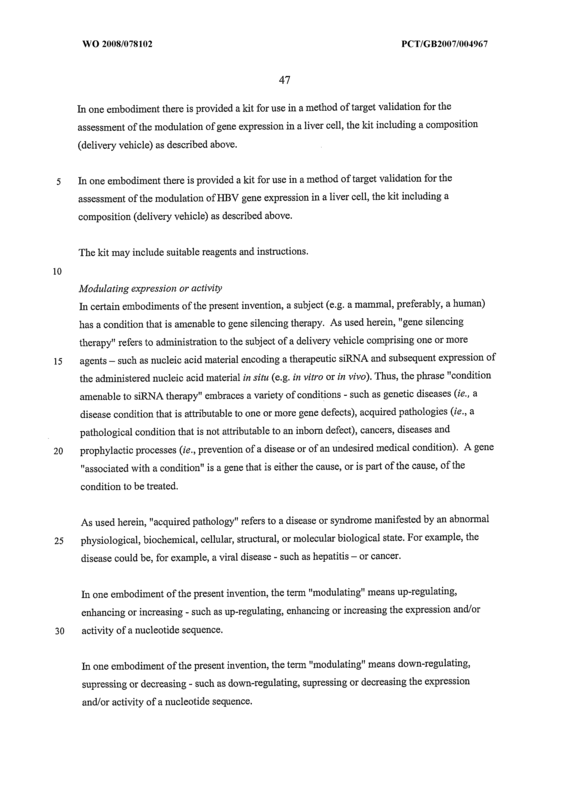 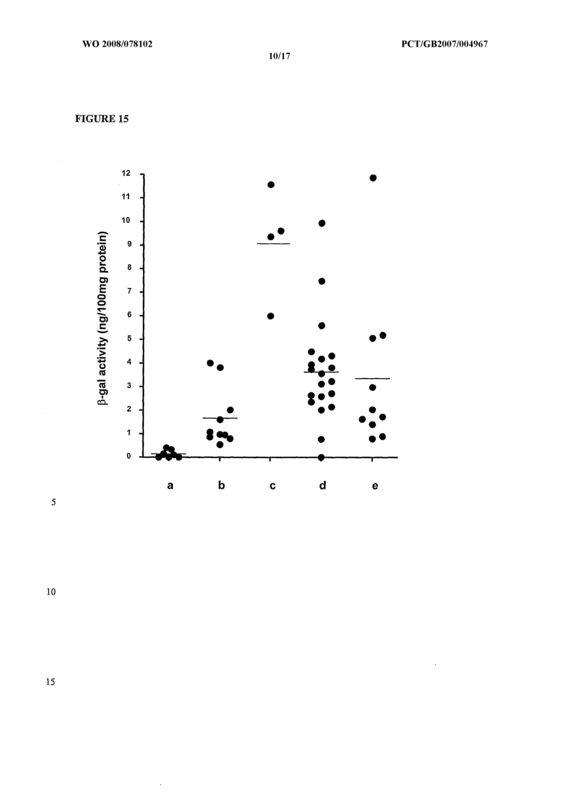 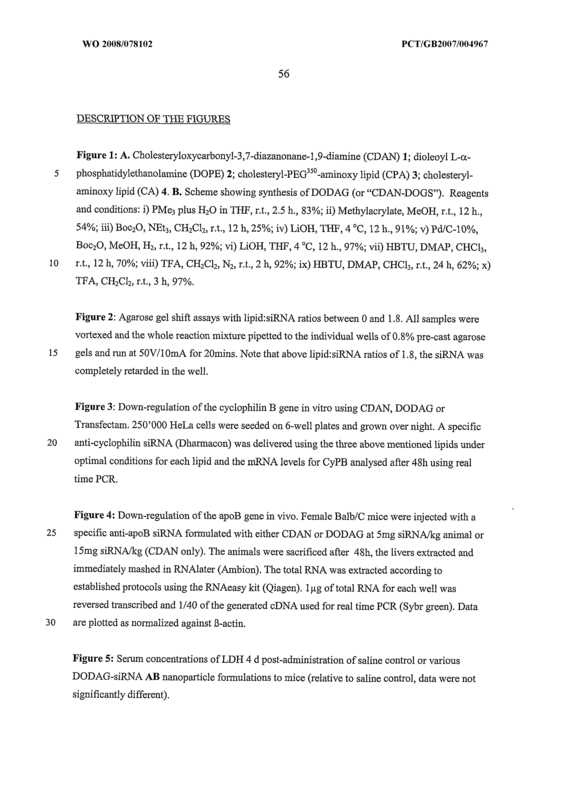 Use of a lipid according to any one of claims 1 to 16 for transfection of cells by one or more agents. 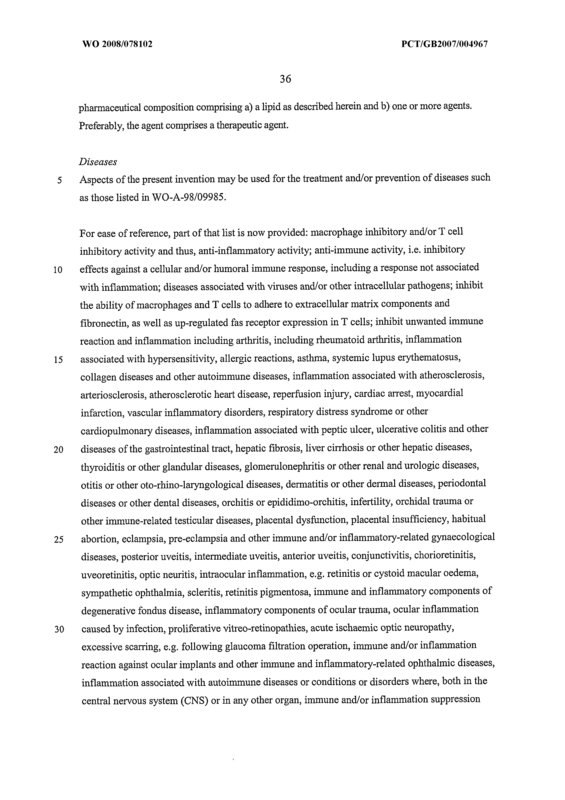 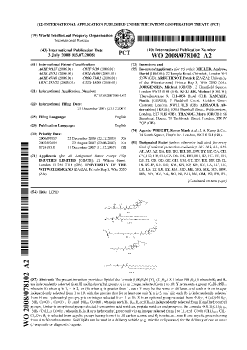 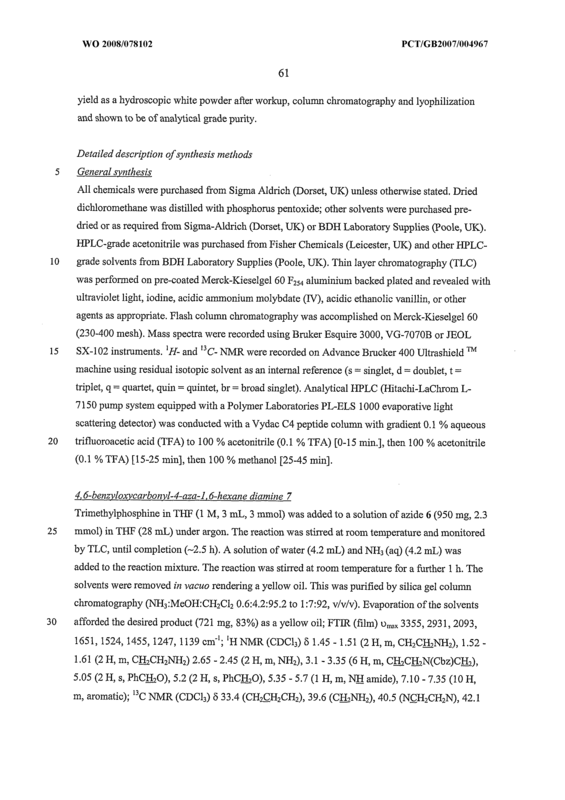 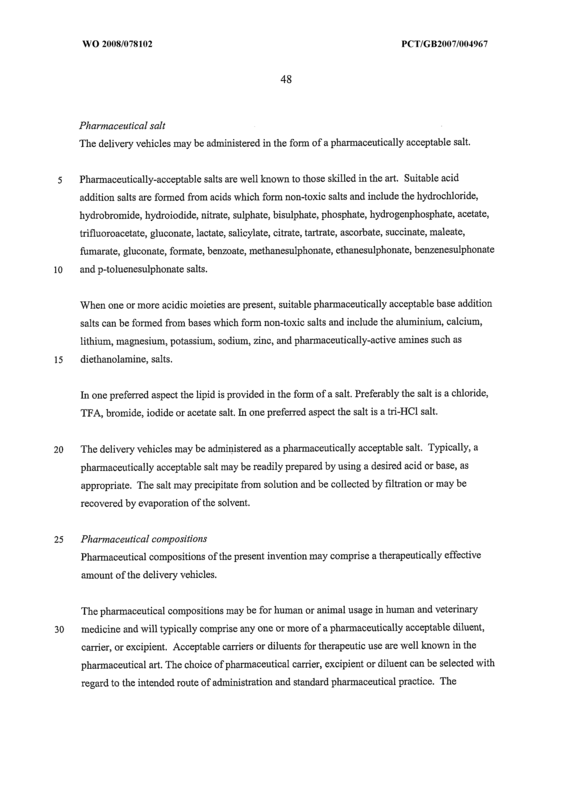 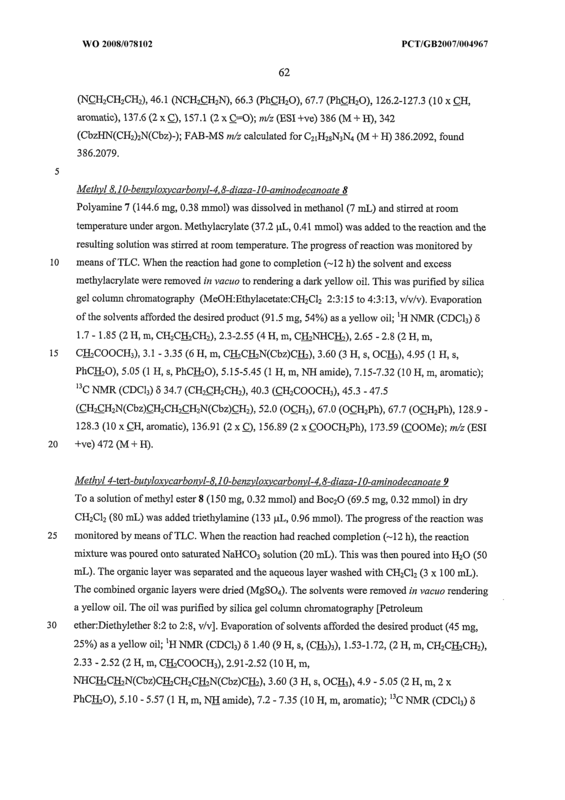 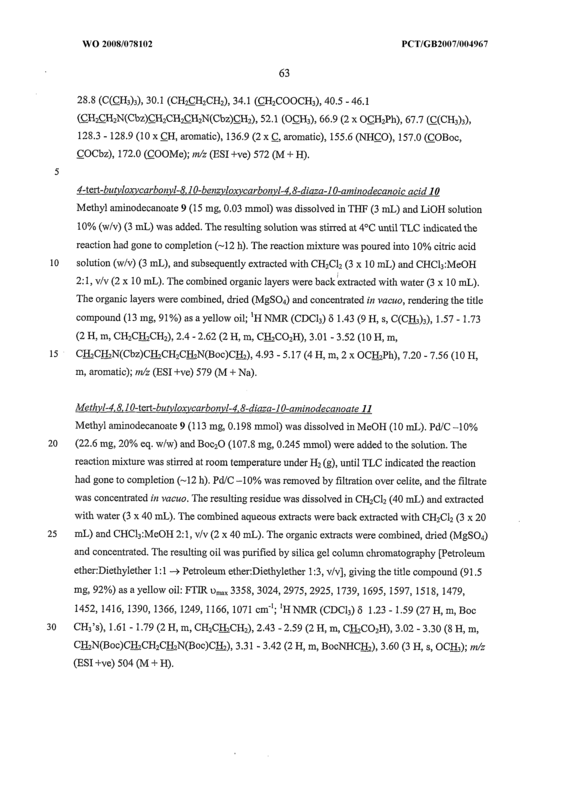 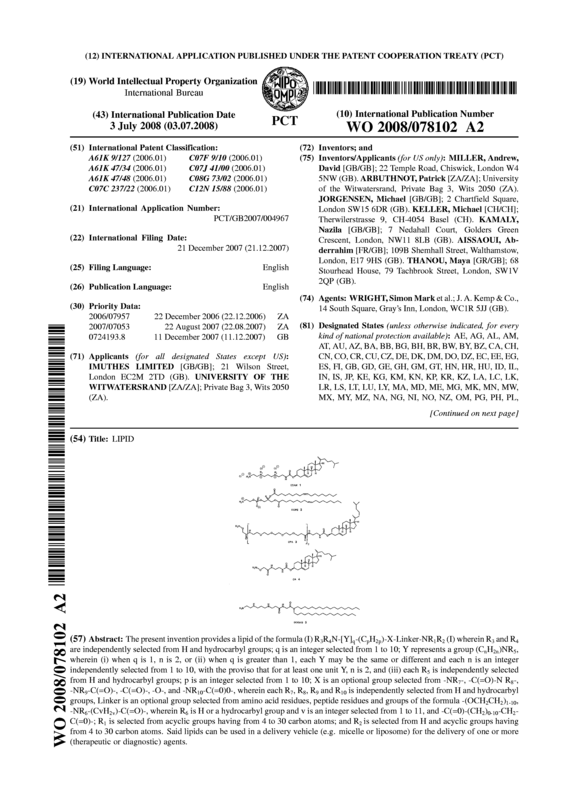 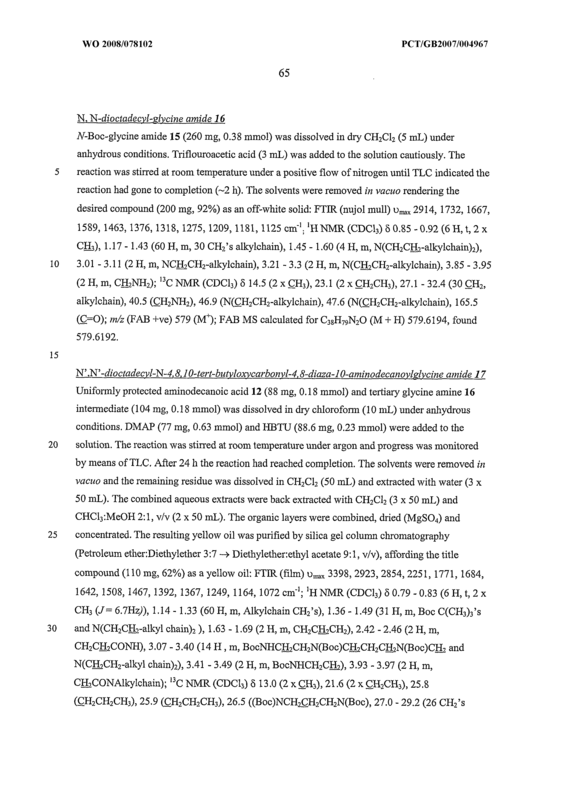 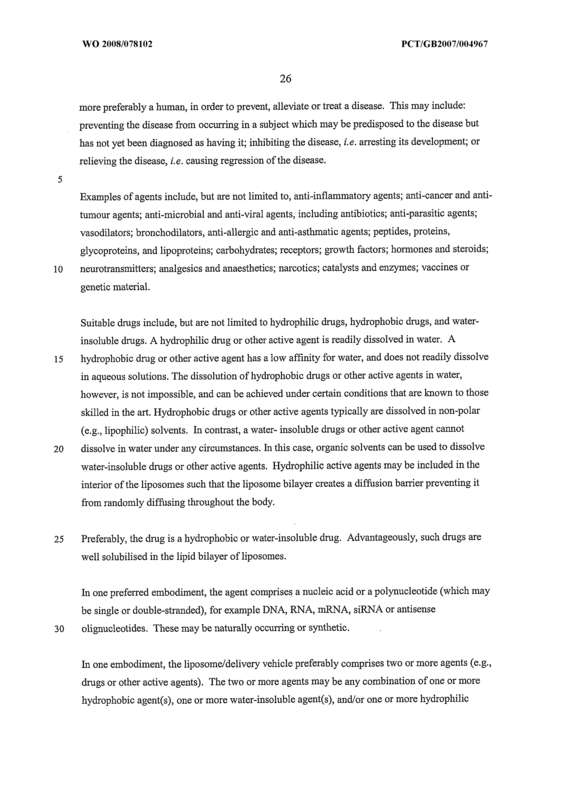 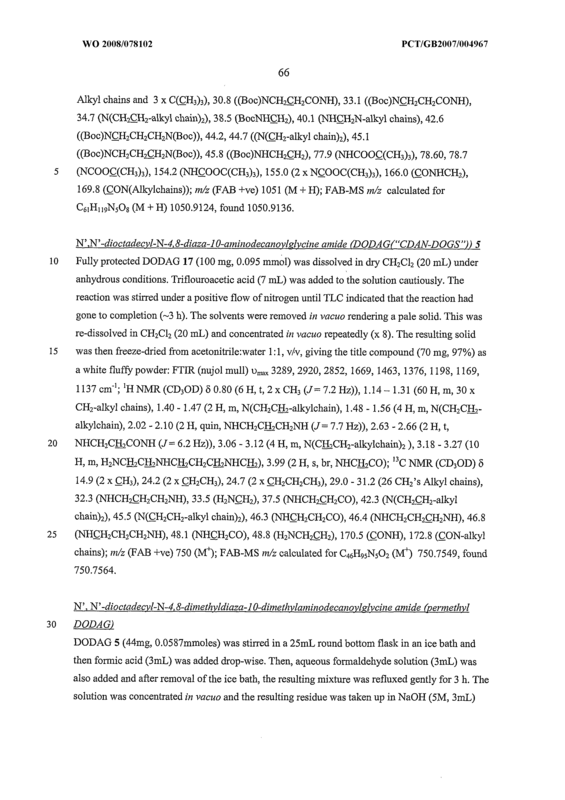 A micelle according to claim 17, a lipid according to claim 18 or a delivery vehicle according to any one of claims 19 to 22, further comprising additional lipids, sterols, fatty acids, dicetyl phosphate, cholesterol hemisuccinate, preservatives PEGylated derivatives of phosphatidylethanolamine, conjugates of sugars and hydrophobic components, diagnostic markers, contrasting media, imaging aids and/or amphiphilic compounds. 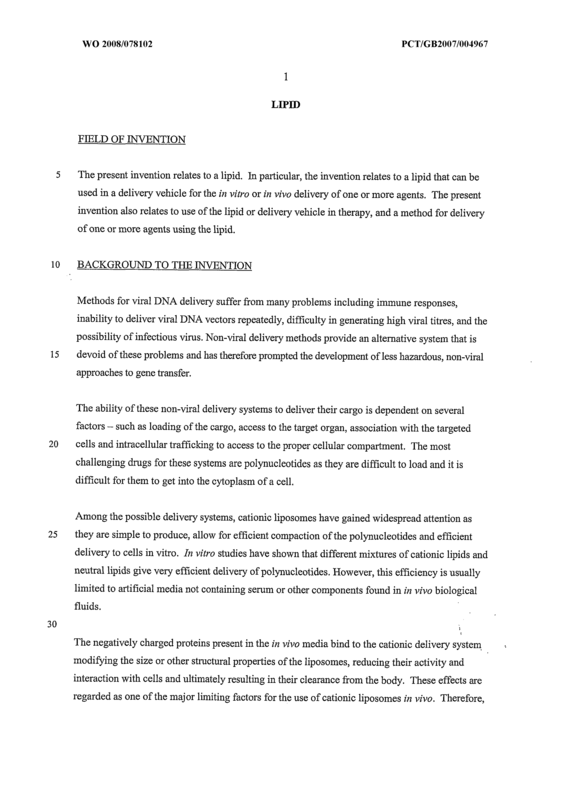 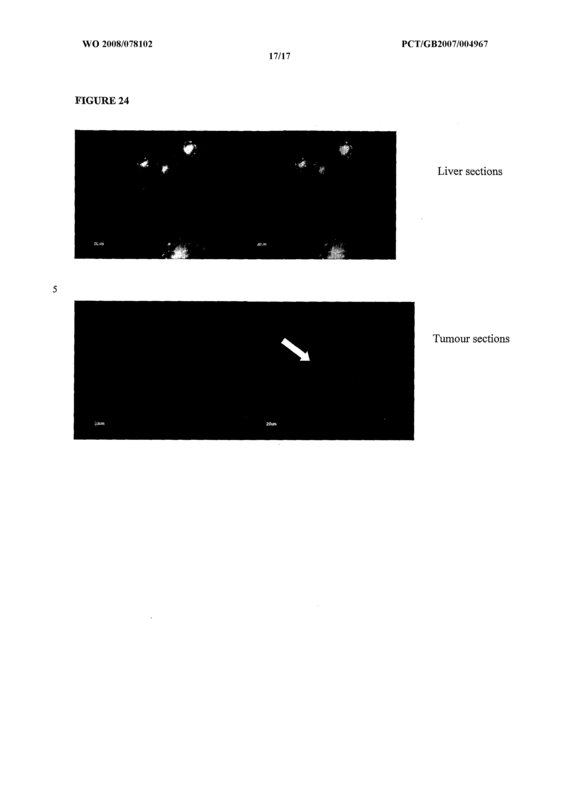 A micelle, liposome or delivery vehicle according to claim 33, wherein the additional lipid is a neutral lipid, sterol lipid, fluorescent lipid, magnetic resonance imaging lipid, nuclear magnetic resonance imaging lipid, electron microscopy and image processing lipid, electron spin resonance lipid or radioimaging lipid. 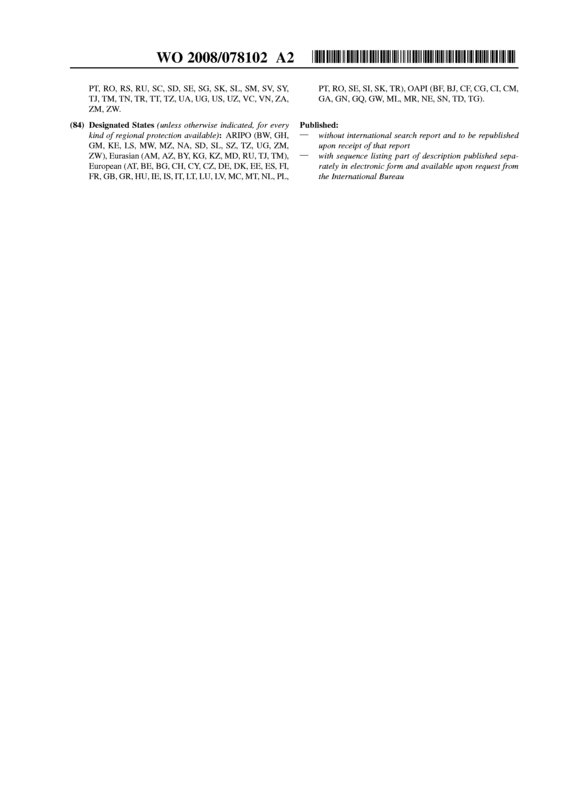 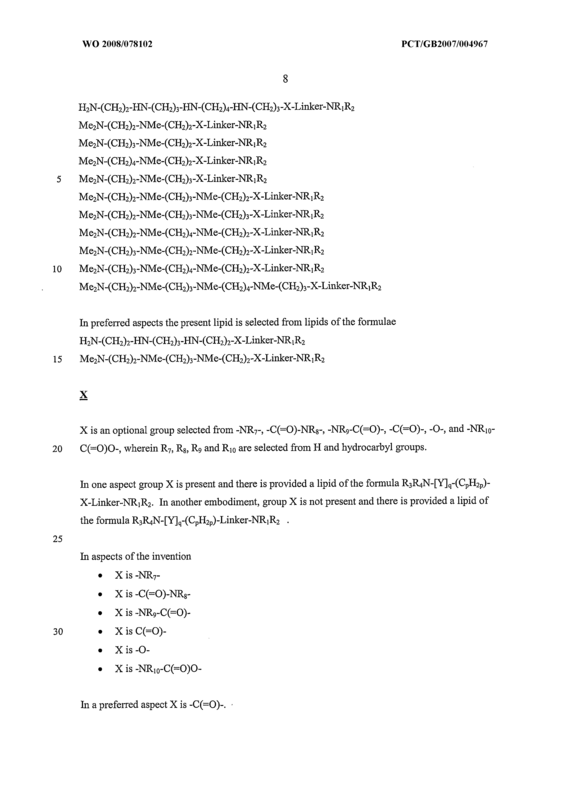 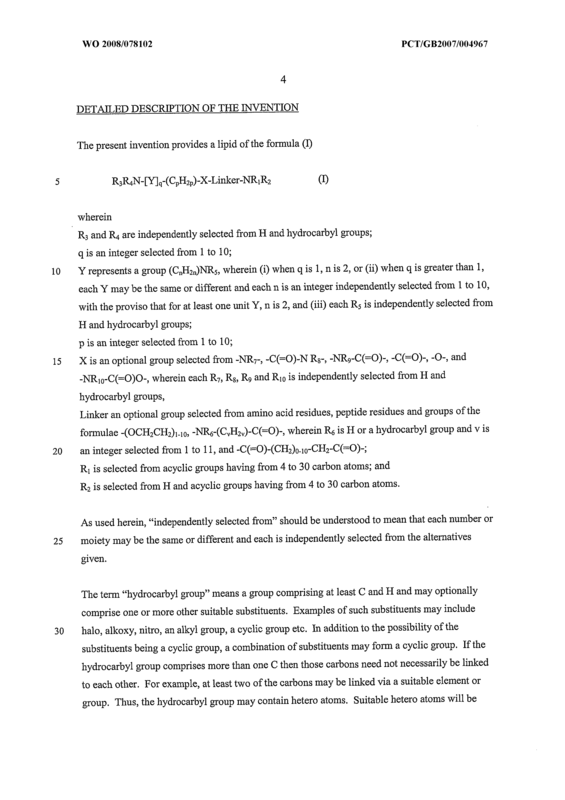 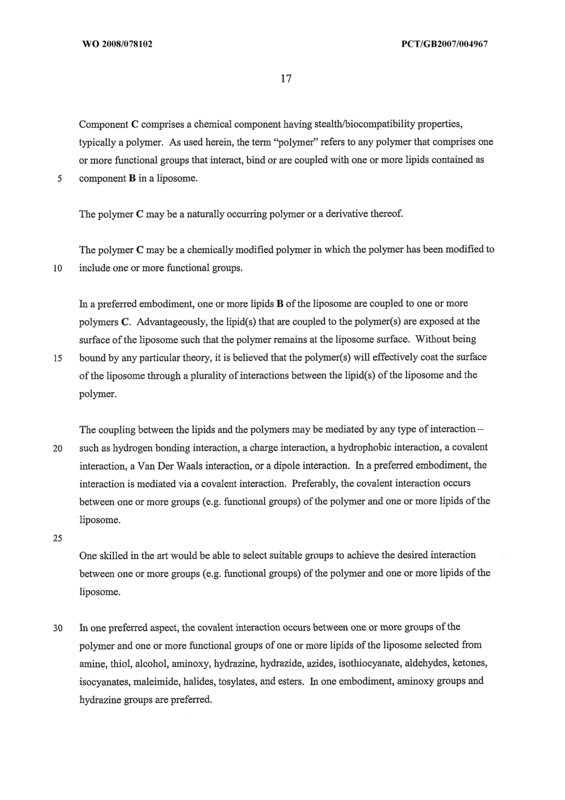 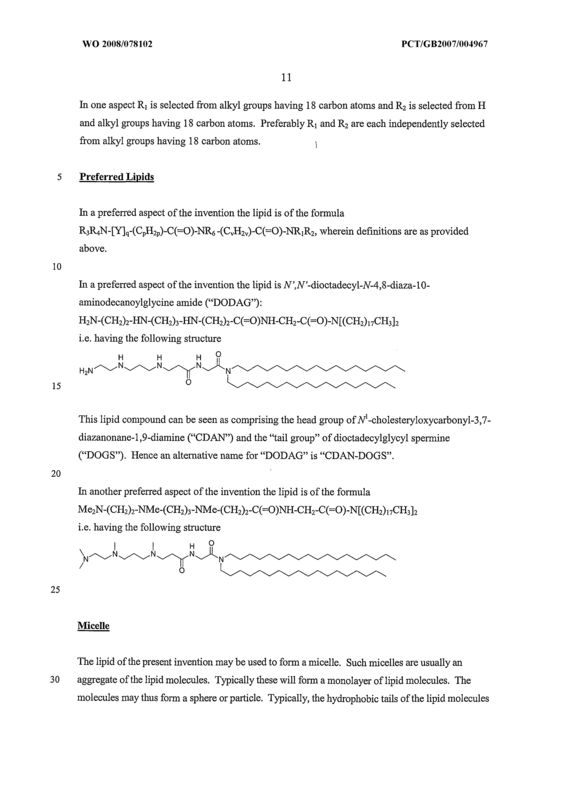 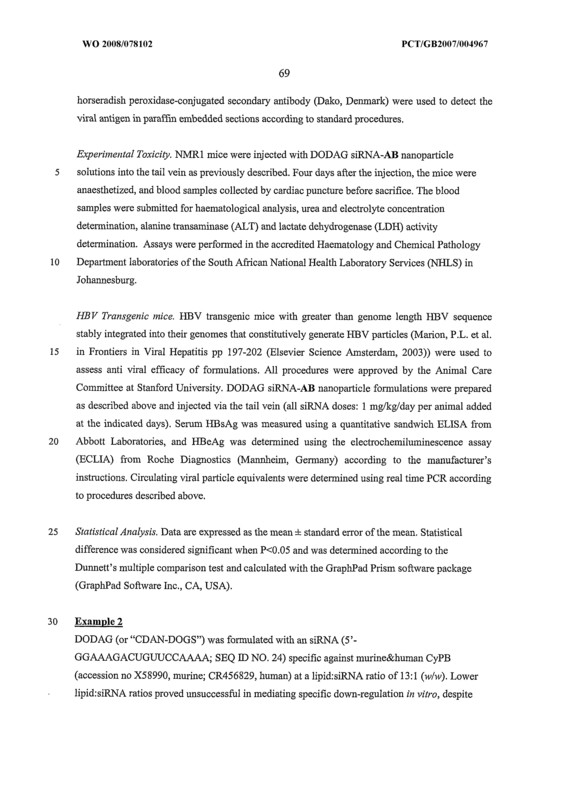 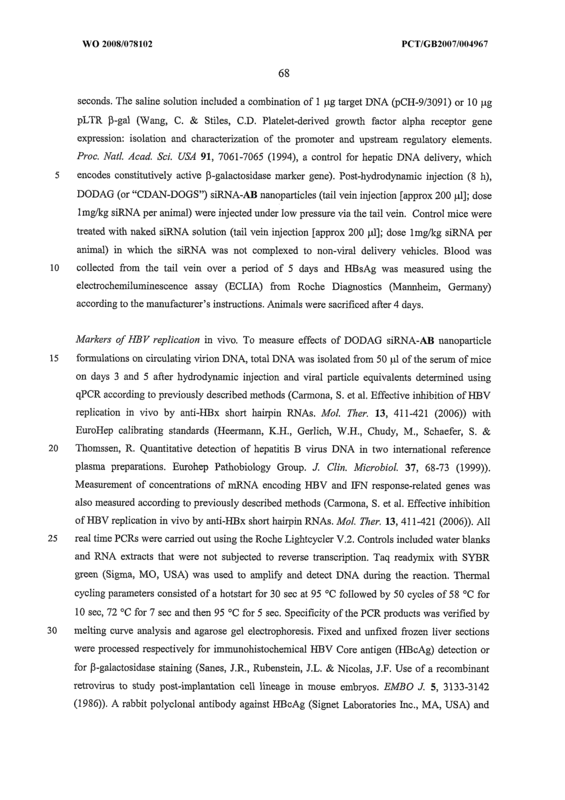 A lipid substantially as described herein and with reference to any one of the Examples or Figures. 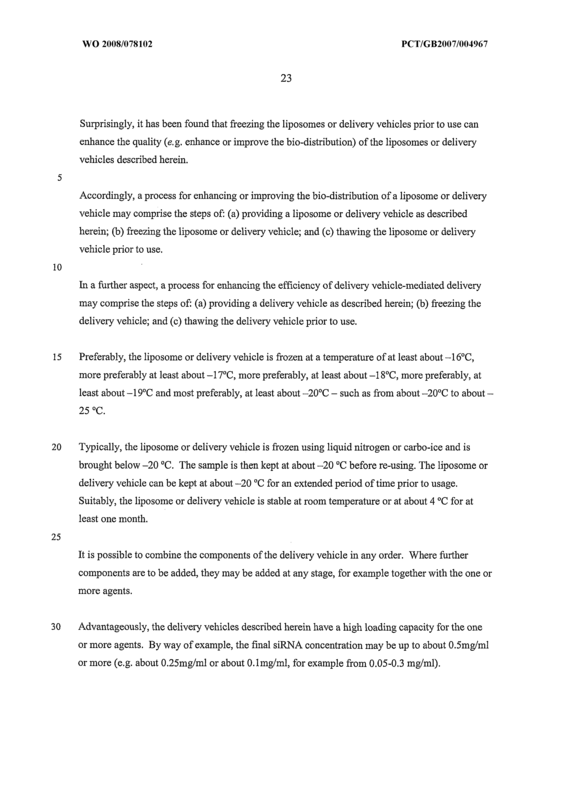 A delivery vehicle substantially as described herein and with reference to any one of the Examples or Figures.